Baltimore is home to 18,000 disconnected youth – young people ages 16 to 24 who are neither working nor in school. Several organizations are working collaboratively to create new paths to opportunity for these young people. Please join us for a stimulating forum with workforce development leaders, policy experts and youth leaders to explore what works and how to strengthen Baltimore’s approach. Jason Perkins-Cohen, Director of the Mayor’s Office of Employment Development, will moderate the panel. Attendance is free. Please RSVP by May 22. Please join JOTF, Maryland Alliance for the Poor, Maryland CASH Campaign, Maryland Center on Economic Policy, and the Maryland Association of Nonprofits as we take a look back at the 2015 Maryland state legislative session. Hear from policymakers and advocates on the issues most important to Maryland’s working families and nonprofit organizations, including paid sick days, reentry, mortgage and debt issues, auto insurance, EITC and the state budget. In light of a nation-wide effort to meet the needs of working parents and their children, JOTF co-hosted the “State of Maryland’s Kids & Working Families” forum May 29 at the Annie E. Casey Foundation in Baltimore. The event served to inform the White House Summit on Working Families, held in Washington, D.C. in June, about the challenges facing working families in Maryland.Participants and speakers focused on the challenges of surviving on minimum wage and caring for a family without access to paid sick days. Those concerns were recorded and taken to the Washington summit by a group of Maryland delegates. Jason Perkins-Cohen, JOTF’s executive director, talked about the importance of creating policies, both at the state and national level, to support families, regardless of income or job description. “The ability to care for yourself and your kids has nothing to do with the number of degrees you have or the digits on your paycheck,” he said. Other forum speakers included Latifa Lyles, director for the US Department of Labor, Women’s Bureau; Elizabeth Sachs, senior advisor to the secretary of the Maryland Department of Labor, Licensing and Regulation; Carol Joyner, director for the Labor Project for Working Families; Becky Wagner, director for Advocates for Children and Youth, as well as local workers and business owners.Amanda Rothschild, a managing owner at the Baltimore café, Charmington’s, told the audience about her decision to pay employees good wages and provide paid sick days. Rothschild explained how these benefits show employees they are valued and with that comes low turnover and increased morale. Event hosts included JOTF, Advocates for Children and Youth, Maryland State Education Association, Public Justice Center, United Workers and Working Matters – The Maryland Campaign for Paid Sick Days. The high cost of car insurance is a significant barrier facing low-income workers in the region. JOTF co-hosted a forum in partnership with the Maryland Consumer Rights Coalition and the Maryland CASH Campaign to explore the issue. Introduced by Tracey Barbour-Gillet and moderated by JOTF’s senior policy analyst Andrea Roethke, presenters discussed the factors that drive up costs for low-income drivers and shared models for reducing the disparity. Speakers included Marty Schwartz of Vehicles for Change and Diane Bell McKoy of Associated Black Charities, who discussed the importance of car ownership and access to affordable insurance. Tom Feltner of the Consumer Federation of America discussed national findings on how rate factors unrelated to driving inflate costs for low-income drivers. Doug Hellter, a consumer advocate from California, discussed the state’s model approach to reforming the insurance system, including the implementation of a targeted low-cost insurance program. Finally, Marceline White of the Maryland Consumer Rights Coalition discussed Maryland-specific findings from a new report, which can be found here. JOTF partnered with the Community Foundation for the National Capital Region to convene Prince George’s County nonprofit and government leaders for a conversation about workforce issues in the region. The event was a follow-up to a 2012 event during which participants expressed hunger for more information about needs and opportunities in the County. JOTF conducted research to build a foundation for deeper discussion and the development of next steps to strengthen the local workforce system. The final product was a report, Obstacles & Opportunities: The Workforce Development Landscape in Prince George’s County, Maryland. At the event, JOTF’s senior policy analyst Andrea Roethke shared the findings of this research. Following the presentation, David Harrington, President and CEO of the Prince George’s Chamber of Commerce, facilitated a group discussion. The conversation gave participants the opportunity to discuss which issues resonate most strongly based on participant’s experience in the County and how to proceed with next steps for increasing access and opportunity in the workforce system. Collaborating with the Prince George’s Chamber of Commerce for the first time, JOTF hosted a forum in September dedicated specifically to Maryland’s new Employment Advancement Right Now initiative. The event, generously hosted by Kaiser Permanente at their Medical Center in Largo, featured a unique panel of speakers who took questions from nearly 100 audience members about the EARN program. Designed to develop a highly skilled workforce for in-demand industries like healthcare and construction, EARN will award state grants to industry-led partnerships that train these workers. On May 28, 2013, the Job Opportunities Task Force and the Baltimore Integration Partnership hosted a forum focused on a joint report titled Investing in Baltimore’s Workforce: Leveraging Opportunity and Moving to Scale. The event took place at the University of Baltimore, with an audience of 100 workforce leaders and practitioners. The brief, written by JOTF Senior Policy Analyst Andrea Roethke, reviews trends in public funding for workforce development in Baltimore and also offers recommendations for local action. The forum included a presentation that detailed the paper, along with commentary from a panel of workforce experts. Panelists included Karen Sitnick, director for the Mayor’s Office of Employment Development, Diane Bell-McKoy, president & CEO of Associated Black Charities, and Leonard J. Howie III, secretary for the Maryland Department of Labor, Licensing and Regulation. The event was moderated by Association for Baltimore Area Grantmakers President Celeste Amato. Panelists discussed challenges to improving and educating Baltimore’s workforce, touching on elements of the issue brief, which looks specifically at workforce challenges in Baltimore, how training funds and resources are allocated, and how the decline in funding is impacting the ability to successfully train city residents. The brief recommends leaders in the city and state explore creative strategies for funding training programs, linking capital projects to potential local workers, engaging employers in workforce development, building a coordinated workforce training pipeline and expanding the career pathways model. Hundreds of Marylanders descended on the state capitol in late February to rally in support of increased services for individuals experiencing homelessness and those impacted by a criminal record. A morning rally in front of the statehouse drew lawmakers, advocates, and other supporters to the event sponsored by JOTF and Health Care for the Homeless. Rally goers heard speeches from faith leaders, legislators and Maryland residents who had overcome criminal pasts and homelessness. Following the rally, attendees attended meetings with individual lawmakers to encourage passage of several pieces of legislation including JOTF-supported bills to shield certain misdemeanor crimes from public view, create a paid sick days standard for all Maryland workers, and remove a question from state job applications that asks applicants to check a box if they have ever been convicted a crime. To mark the introduction of Maryland Earned Sick and Safe Leave Act, JOTF gathered with lawmakers and Maryland Campaign for Paid Sick Days supporters in Annapolis. More than 70 supporters came out in January to demonstrate the strong support for the new legislation. The 30-minute event featured comments from lawmakers, JOTF staff members, educators, business owners and most importantly, workers living without access to Paid Sick Days. Matt Burchell, a restaurant worker in Anne Arundel County, explained that missing work can mean significant financial setbacks. Following the event, bill sponsors Senator Robert Garagiola (D-Montgomery) and Delegate John Olszewski Jr. (D-Baltimore County) filed the bills in both chambers. In an effort to enrich the Maryland Campaign for Paid Sick Days, JOTF, along with other members of the Working Matters coalition, hosted a Carrotmob in January at Busboys and Poets in Hyattsville. JOTF supports creating a Maryland-wide standard by which workers would earn paid sick leave based on the number of hours they work. More than 700,000 workers in our state have no access to paid sick leave and often come to work ill or risk losing income to stay home and recover or care for family members. Carrotmobbing is a way to use our consumer dollars and buying power to reward businesses that have socially responsible practices. As patrons of companies with good business practices, we can encourage our peers and lawmakers to see the importance of valuing workers and their families. Working Matters hosted our carrotmob at Busboys and Poets because owner Andy Shallal makes sure his staff members have the opportunity to take a paid day off when they or a loved one are sick. This means Busboys and Poets employees can get well sooner, bring fewer germs to the workplace and are more likely to stay in their jobs. The event, designed to kick of the legislative session, featured remarks from lawmakers, advocates and Mr. Shallal, who explained that offering paid sick days to his employees is the right thing to do and makes up less than 1 percent of his payroll costs. The Job Opportunities Task Force, along with partners from the Working Matters coalition, recently launched a campaign to give Maryland workers access to paid sick days. New data suggests that more than 700,000 employees in our state cannot earn paid leave under existing company policies, leaving them vulnerable to wage or job loss when they or a family member becomes sick. The forum and campaign launch, hosted Nov. 14 at Westminster Hall in Baltimore, featured more than a dozen speakers who espoused the importance of paid sick days to nearly 100 workers’ rights advocates, nonprofit leaders and policy experts. Speakers included workers, public health officials, educators, parents, our legislative partner Del. John A. Olszweksi, Jr. and nationally-renowned workers’ rights expert Ellen Bravo. Bravo, who directs the Family Values @ Work Consortium, opened the forum by debunking myths that all employers already arrange sick leave for their workers and explaining that there is urgent need for access to sick leave, especially for low-income workers who are most likely to lack the protection of paid sick leave. Eighty percent of low-wage workers cannot earn sick leave and women-dominated professions tend to have the least access to sick days, despite the fact that women are often primary caregivers at home. Each year Maryland ranks among the wealthiest states with the best education system. Unfortunately, there are still great disparities in our state and despite working hard, many families struggle to be self-sufficient. In fact, of the 10 most common professions in Maryland, only two pay enough to fully support a family of three. On November 13, the Job Opportunities Task Force, along with the Baltimore and Maryland CASH Campaigns and the Maryland Community Action Partnership, hosted a forum to address the true expense of living in such a wealthy state. Inspired by the findings of the “The Self-Sufficiency Standard for Maryland 2012” and the Corporation for Enterprise Development’s “Assets & Opportunity Scorecard,” the forum explored what it takes to get by in different Maryland counties. We examined the challenges low-wage workers face in today’s labor market as well as strategies for increasing the economic security of low-income families. The event, held at the Annie E. Casey Foundation, featured panelists Dr. Diana Pearce, director for the Center for Women’s Welfare, Dr. Heidi Shierholz, an economist with the Economic Policy Institute and Ethan Geiling, a senior policy associate with the Corporation for Enterprise Development. This September 20 panel discussion focused on negligent hiring myths and facts as they relate to employing people with criminal records. Individuals with criminal records need to work and earn a living, just like the rest of us. Employers want and need competent, reliable workers. However, they also want to make careful staffing decisions to avoid hiring someone who may put the company at risk of a lawsuit. While it is relatively rare for an employer to be successfully sued for negligent hiring in Maryland, liability issues are a reality that employers should understand and know how to manage. During this forum attendees heard from Antonia K. Fasanelli, executive director for the Homeless Person’s Representation Project, Amy Solomon, senior adviser to the Assistant Attorney General, Office of Justice Programs at the U.S. Department of Justice, and Art Wallenstein, director for the Montgomery County Department of Corrections and Rehabilitation. Panelists discussed the facts about negligent hiring and theories of employer liability. They offered a better understanding of legal principles and suggested measures that employers can take to hire good workers while minimizing risk. On May 16, JOTF partnered with the Maryland Budget and Tax Policy Institute, Maryland Nonprofits, Advocates for Children and Youth, Maryland Consumer Rights Coalition, and the Maryland CASH Campaign to host a wrap-up of the 2012 state legislative session. Henry Bogdan, public policy director at Maryland Nonprofits, opened the event by welcoming everyone to Annapolis and introducing Neil Bergsman, director of the Maryland Budget and Tax Policy Institute. Bergsman presented an overview of how the budget process played out during the 2012 session, specifically how the legislature – on the final day of the session – approved the budget but not the revenue and reconciliation legislation needed to fund it. A special session was called for May 14-16 where the legislature met to approve revenue and reconciliation legislation, consequently averting $500 in automatic “doomsday” cuts. Bergsman was followed by a panel of nonprofit advocates. David Beard, education policy director at Advocates for Children and Youth; Melissa Broome, senior policy advocate at the Job Opportunities Task Force; Matt Celentano, deputy director at Maryland Healthcare for All; Robin McKinney, director of the Maryland CASH Campaign; and Marceline White, director of the Maryland Consumer Rights Coalition described the legislative priorities tracked by their respective organizations during the session and took questions from the audience. The event concluded with a keynote by Lea Gilmore, program director for the Moving Maryland Forward Network, on social media as an advocacy tool. MMFN is a new initiative to connect organizations focused on social advocacy in Maryland. It seeks to build a unique network of progressive campaigns working to ensure fairness, equality and justice for all Marylanders. Gilmore’s presentation emphasized the need for nonprofits to harness the power of online organizing tools. On April 26, the Federal Reserve Bank of Richmond hosted the first event in the four-part Redefining Capital: A Forum Series on Greater Baltimore’s Next Economy. The event was presented in partnership with JOTF and a wide range of other philanthropic and community partners. The half-day event focused on human capital and enhancing economic growth, and featured the release of a new Brookings Institution report entitled Building From Strength: Creating Opportunity in Greater Baltimore’s Next Economy. The report highlights the need to do a better job fostering the growth of quality jobs, and the need to better connect low-income workers to these opportunities. Some recommendations include: increasing Baltimore’s export economy; supporting innovation and entrepreneurship; growing the clean economy; and improving the education and workforce delivery systems. Attendees also heard from a wide range of speakers and panelists who addressed the opportunities and challenges before us. 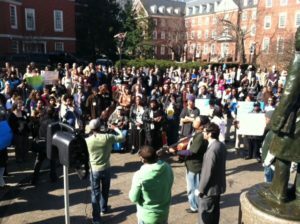 On March 1, 2012, hundreds of Marylanders descended on the capital to advocate for policies to reduce barriers to employment for people with criminal records. (Click here for video coverage.) The daylong event included a rally on Lawyers’ Mall, legislator visits, informative workshops, and numerous reentry bill hearings. Contact Melissa Broome for information on how you can help support important reentry advocacy initiatives. On Monday January 23rd, JOTF partnered with the Baltimore CASH Campaign and the Maryland CASH Campaign to host a public discussion on the seemingly predatory nature of recruitment and management practices of most for-profit trade schools. After opening remarks and introductions from JOTF’s Executive Director, Jason Perkins-Cohen, Luke Swarthout, former Senior Higher Education Advisor for the U.S. Senate Health, Education, Labor and Pensions Committee, began the discussion by providing an overview of what initially prompted a closer look into the practices of for-profit colleges and universities and the resulting congressional fixes. Former Editor of Higher Ed Watch, Stephen Burd, discussed new regulations requiring for- profit colleges and universities to obtain at least 10% of their revenue from nonfederal sources to be eligible for federal student aid and new rules which would require for-profit schools to show that graduates are earning enough to pay down the loans taken out to participate in the courses. Kimberly Jones, Associate Vice President of Public Policy for the Council for Opportunity in Education, discussed how low-income, first-generation minority students are specifically targeted and recruited by most for-profits due to their presumed lack of information, guidance, options and understanding of what would be required of them, especially financially. On October 19, 2011, JOTF, Health Care for the Homeless and SHARP, a coalition of service providers and advocates working to Stop Homelessness and Reduce Poverty, hosted a reentry focused forum entitled “Bars Are Not the Only Barriers: Realities for a Returning Citizen” at the Our Daily Bread Employment Center. Attended by approximately 60 people, Tomi Hiers, Deputy Chief of Staff and Director of the Mayor’s Office of Human Services, provided opening remarks. Lisa Klingenmaier presented Health Care for the Homeless’ new research report “Still Serving Time: Incarceration and Re-Entry in Maryland.” Rev. Kwame Osei moderated a panel which included Alfreda Robinson-Dawkins, Founder and Executive Director of the National Women’s Prison Project, Inc., Jason Perkins-Cohen, JOTF Executive Director, Purman Smith, Health Care for the Homeless client, and Monica Cooper, Leadership Development Organizer for Out For Justice. Panel members answered questions regarding challenges faced by those with a criminal background and initiatives to facilitate successful re-entry. On June 17, 2011, BRIDGE, CASA de Maryland, JOTF and various community stakeholders sponsored a public meeting to advance sustainability, inclusion and fair development. This event brought together members of the faith community, civic leaders, non-profit organizations, national experts, Maryland elected officials and key representatives of the Obama Administration to work together to strengthen local communities to build a better Maryland. The meeting showcased the State of Maryland, local jurisdictions and citizen organizations as national models for sustainable and inclusive communities and helped to organize the building blocks needed to take the State to the next level. The meeting focused on Purple and Red Line jobs and fair development, inclusive housing, regional mobility approaches and sustainable community strategies. Attending were HUD Deputy Secretary Ron Sims, DOT Deputy Secretary John Porcari, Congressman Steny Hoyer, Prince George’s County Executive Rushern Baker, and various key leaders. On June 1, 2011, JOTF, the Baltimore CASH Campaign, and the Maryland CASH Campaign co-hosted “Taxing the Poor: Doing Damage to the Truly Disadvantaged,” a forum featuring Dr. Katherine S. Newman, James B. Knapp Dean of the Zanvyl Krieger School of Arts and Sciences at Johns Hopkins University. Dr. Newman, a widely published expert on poverty and the working poor, spoke about her recently-published book, which looks at the way we tax the poor in the United States, particularly in the American South, where poor families are often subject to income taxes, and where regressive sales taxes apply even to food for home consumption. Newman argued that these policies contribute in unrecognized ways to poverty-related problems like obesity, early mortality, high school dropout rates, teen pregnancy and rime. Taxing the Poor demonstrates how sales taxes intended to replace the missing revenue actually punish the poor and exacerbate the very conditions that drove them into poverty in the first place. On April 21, JOTF partnered with Advocates for Children and Youth, Maryland Alliance for the Poor, Maryland Nonprofits, Maryland Budget and Tax Policy Institute, Maryland CASH, and the Maryland Consumer Rights Coalition to host a wrap-up of the 2011 state legislative session. Henry Bogdan, public policy director at Maryland Nonprofits, opened the event by welcoming everyone to Annapolis and introducing Senator Edward Kasemeyer, chairman of the Senate Budget and Taxation Committee. Senator Kasemeyer spoke of the importance of advocates working at the grassroots level and also commented that the state needs to move to broaden the sales tax base to generate much-needed revenue. Senator Kasemeyer was followed by a panel of nonprofit advocates. Melissa Broome, senior policy advocate at JOTF; Robin McKinney, director of the Maryland CASH Campaign; and Marceline White, executive director of the Maryland Consumer Rights Coalition described the legislative priorities tracked by their respective organizations during the session and took questions from the audience. Neil Bergsman, director of the Maryland Budget and Tax Policy Institute, provided the group with an overview of how the budget process played out during the 2011 session and noted that while economic growth has resumed, it hasn’t been enough to fuel a broad, sustainable recovery. He also stated that the budget passed during the 2011 session leaves a billion-dollar long-term problem for upcoming years. Bergsman urged advocates to get involved now as departments begin making budget decisions for next year and as the fall 2011 special session will soon be upon us. A second panel of nonprofit advocates followed Bergsman’s presentation. Melissa Rock, child welfare director at Advocates for Children and Youth; Branden McLeod, chair of the Maryland Alliance for the Poor; and Henry Bogdan, public policy director at Maryland Nonprofits described legislative priorities tracked by each of their organizations during the session and took questions from the audience. The event concluded with a keynote by Nick Johnson, vice-president for state fiscal policy at the Center on Budget and Policy Priorities. Johnson’s presentation, “The Budget and Fiscal Condition of the States,” emphasized how despite modest signs of improvement, states still face a long road to recovery and will continue to feel the impact of the recession. He noted that state tax collections have declined while the need for state-funded services has not. Consequently, even after making very deep spending cuts over the last several years, states continue to face large budget gaps. States are going to continue to struggle to find the revenue needed to support critical public services for a number of years, threatening hundreds of thousands of jobs. Are Criminal Backround Checks Misleading Emoloyers? On November 30, JOTF partnered with the Re-Entry of Ex-Offenders Clinic at the University of Maryland School of Law to host a public forum on the use of criminal background checks by employers. Kiminori Nakamura, assistant professor in the Department of Criminology and Criminal Justice at the University of Maryland, presented findings from research he co-authored while at Carnegie Mellon University. Click here to view his PowerPoint presentation. Nakamura’s report, “Redemption in an Era of Widespread Criminal Background Checks,” finds that there is a way to actuarially estimate a point in time when an individual with a criminal record is of no greater risk of committing another crime than any other individuals of the same age. His analysis provides the criminal justice community with the first scientific method for estimating how long is long enough for someone with a prior record to remain arrest-free before he or she should be considered “redeemed” by prospective employers. Donald Washington and Steve O’Neill from Massachusetts-based Ex-Prisoners and Prisoners Organizing for Community Advancement (EPOCA)presented an overview of the recent legislative overhaul of Massachusetts’ criminal background check system. EPOCA members played an instrumental role in the victory which included banning the box on both state and private sector employment applications, and reducing the time for sealing felony convictions from 15 to 10 years, and misdemeanors from 10 to 5 years. Click here to view the Massachusetts legislation. O’Neill described the large coalition of organizations that came together to support the legislation while Washington highlighted the tremendous impact that was made by the number of individuals with criminal records who got involved in advocating for themselves. Click here for a copy of the EPOCA handout that was distributed at the forum. JOTF Executive Director, Jason Perkins-Cohen, closed the forum by informing participants that legislation will be reintroduced during Maryland’s upcoming 2011 legislative session to ban the box from state job applications. Those who are interested in lending support to the bill should contact JOTF’s Senior Policy Advocate, Melissa Broome at 410-234-8046. On September 13, 2010, JOTF, the Baltimore CASH Campaign, and the Maryland CASH Campaign co-hosted a forum on financial issues in post-secondary access and success. The forum featured three national experts, who highlighted strategies for improving need-based aid systems and for increasing savings opportunities. The event was supported by the Working Poor Families Project, and hosted by the Annie E. Casey Foundation. Amy Ellen Duke-Benfield of the Center for Law and Social Policy began by discussing the financial barriers many low-income students face, and highlighted best practices in need-based aid. Mark Huelsman of the New America Foundation spoke on the importance and effectiveness of college savings for low-income families, and discussed key elements of a strong savings policy framework. Leigh Tivol of CFED concluded the forum by sharing details on a new initiative – the Partnership for College Completion – that gives students access to a college savings account and academic supports. Click here to view Amy Ellen Duke-Benfield’s presentation on financial aid barriers and opportunities. Click here to view Mark Huelsman’s presentation on college savings. On July 14, JOTF and Associated Black Charities held a forum to release a joint issue brief exploring strategies to build Baltimore’s black middle class. The report, entitled Expanding Baltimore’s Black Middle Class: Workforce Strategies for Advancing Prosperity, describes the challenges and opportunities facing Baltimore’s African-American workforce, and provides concrete recommendations for advocates and policymakers. At the event, report author Andrea Payne Roethke discussed the brief’s findings. She focused on three key areas for change: expanding the number of good jobs within the city, building pathways to help low-skill workers access these jobs, and reducing employment discrimination. The event also featured a discussion of one of the report topics already being explored by city leaders: policies that require city contractors to hire locally. Diane Bell-McKoy, President and CEO of Associated Black Charities, moderated the conversation, which featured Jayson Williams, Political Director of the Laborers’ International Union of North America (LiUNA) in Maryland, and Pless Jones, President of the Maryland Minority Contractors Association. Williams explained LiUNA’s work on the Get Baltimore Working campaign for community partnership agreements, while Jones shared concerns that certain policy approaches could hurt local minority business. On May 26, 2010, JOTF partnered with Maryland CASH, Maryland Association of Nonprofits, Maryland Budget and Tax Policy Institute, and the Maryland Consumer Rights Coalition to host a wrap-up of the 2010 state legislative session. Henry Bogdan, public policy director at the Maryland Association of Nonprofits, opened the event by welcoming everyone to Annapolis and introducing Neil Bergsman, director of the Maryland Budget and Tax Policy Institute. Bergsman provided the group with an overview of how the budget process played out during the 2010 session and noted that Maryland will likely need to reduce spending next year as federal stimulus funds diminish and increases in mandated spending come with Medicaid, retirement and debt service. He also noted that the state would need a 15% increase in annual growth if it were to finance next year’s budget without any cuts. Growth is estimated to be at 4.3%. The budget overview was followed by a panel of nonprofit advocates. Melissa Broome, senior policy advocate at JOTF; Robin McKinney, director of the Maryland CASH Campaign; Marceline White, executive director of the Maryland Consumer Rights Coalition; Branden McLeod, chair of the Maryland Alliance for the Poor; and Matthew Joseph, executive director of Advocates for Children and Youth described the legislative priorities tracked by their organizations during the session and took questions from the audience. Maryland’s Secretary of Budget and Management, T. Eloise Foster, then provided an overview of Maryland’s fiscal 2011 budget and noted the O’Malley Administration’s commitment to restoring fiscal responsibility in Maryland. She stated that actions taken during the 2010 session improve the outlook for FY 2012 by about $1 billion but that challenges still remain. The event concluded with a keynote by Erin Currier from the Pew Charitable Trusts’ Economic Mobility Project. The Project seeks to broaden the focus of the current economic debate in America to include economic mobility, and to develop bipartisan solutions to enhance economic mobility. Pew’s new report, “A Penny Saved is Mobility Earned,” defines economic mobility as the ability of individuals or families to move up or down the economic ladder within a lifetime (intragenerational), or from one generation to the next (intergenerational). On April 22nd, JOTF partnered with the University of Maryland School of Law and the Baltimore CASH Campaign to present a workshop on unemployment insurance in Maryland. The forum was attended by service providers, advocates, and lawyers from around the region. The event gave attendees an overview of the UI policy landscape, and an in-depth look at UI eligibility criteria and the appeals process. JOTF Executive Director Jason Perkins-Cohen opened the event with a discussion of the importance of the UI safety net for vulnerable workers. He also discussed recent policy changes, including an increase in the maximum benefit, eligibility for part-time workers, adoption of the alternative base period, and extended benefits for workers in approved training programs. Perkins-Cohen cautioned that the push for cost-neutrality often puts benefit cuts on the table alongside positive change, and called on attendees to stay engaged in the policy process. A group of students from the University of Maryland School of Law’s Worker’s Rights Clinic followed with an in-depth presentation on the practical and legal side of navigating the UI system. They provided details on the application process, eligibility and disqualification rules, the appeals process, and tips for clients involved in appeals. Judy Smylie, Director of the Lower Appeals Division at the Department of Labor, Licensing and Regulation, was on hand to answer questions at the end of the session. On January 7, 2010, JOTF and the Baltimore CASH Campaign co-hosted their annual “Making Tax Time Pay” forum, which gives local organizations the information they need on tax benefits available to low-wage workers and local free tax prep resources. A group of nearly 50 service providers and advocates came to learn more about the importance of filing a return for low-wage workers, and how to get the word out to clients. Rob Bader from the Baltimore CASH Campaign provided an overview of tax credits available to low-wage workers, including the Earned Income Tax Credit (EITC), the Child Tax Credit, and the Dependent Care Credit. The EITC is the most meaningful for families, since it provides a refundable credit worth any where from a few hundred to a few thousand dollars, depending on a family’s size and income. For many families, the EITC is a windfall that can either help them catch up on basic expenses, or help them with a much-needed major expense such as a reliable car. The forum also provided information on new and expanded tax benefits created by the American Recovery and Reinvestment Act (ARRA). In addition to increasing the EITC overall, the IRS also added a new category and EITC amount for larger families with three or more children. An additional tax credit called the Making Work Pay Credit was also introduced. From April to December of 2009, the credit increased take-home pay by up to $400 per taxpayer. Other ARRA benefits include an expanded Child Tax Credit, an expanded education tax credit, and an exemption waiving taxes on the first $2,400 of unemployment insurance benefits. The CASH Campaign provided information on their 20 free tax prep sites around the Baltimore area. For more information, call 443-692-9487. On December 16th, JOTF partnered with the Federal Reserve Bank of Richmond to host a forum on jobs and the economy in Maryland. The forum featured a presentation by Andy Bauer, a Regional Economist with the Fed, and responses from two panelists – Maryland Secretary of Labor, Licensing and Regulation (DLLR) Alex Sanchez, and JOTF Executive Director Jason Perkins-Cohen. Stakeholders from workforce development agencies, social service providers, business groups, and government agencies attended to hear thoughts on the direction of the local economy, and to discuss next steps for getting Marylanders back to work. Bauer’s presentation focused on recent labor force trends in Maryland, and concluded with thoughts on the trajectory of the economy over the next decade. While Maryland has fared better than most states through the recession, Bauer projected that the recovery would still be slow. As we begin to see new job growth, it will be concentrated in fields requiring at least some post-secondary education. Laid off workers may have to build new skill sets to move into these industries. Sanchez responded with an overview of DLLR’s priorities for the year, and fielded questions on what the state can do to get Marylanders back to work. Perkins-Cohen concluded with thoughts on where policymakers should focus their efforts to improve conditions for workers in the state, including strengthening the unemployment insurance system and improving the coordination of workforce development in the region. On October 16, JOTF co-hosted a forum with the Baltimore and Maryland CASH Campaigns to explore state asset policy. At the event, Kasey Wiedrich of CFED shared the details of Maryland’s 2009-2010 Assets and Opportunity Scorecard. The scorecard measures the financial security in the state, looking at outcome data around wealth and poverty, business and employment, housing, health care, and education. It also assesses the strength of state policies in each of these areas. The scorecard shows that while Maryland is a wealthy state, there are significant disparities between rich and poor, and our residents carry high levels of credit card and installment debt. While we have some of the strongest policies in the nation around predatory lending and payday lending, we are far behind in other areas, lacking strong IDA, college savings, and microenterprise programs to name a few. Click here to view the scorecard. Delegate Dana Stein also spoke, sharing updates on the progress of the state Financial Literacy Task Force. Since being established in 2008, the task force has focused on expanding and improving financial education within the public school system. The task force has also looked at ways to integrate financial literacy into the post-secondary system, and make it more accessible for recipients of public benefits. Robin McKinney, Director of the Maryland CASH Campaign, concluded by discussing legislative action around asset policy. Some progress was made last year, including the passage of a bill allowing taxpayers to split their refunds into multiple bank accounts, and additional legislation will be explored in the coming session – including bills focused on Refund Anticipation Loans and debt settlement. For more information, contact Robin McKinney at 410-528-8006 x817. More than 1 in 10 young Marylanders are both out-of-school and out-of-work. These youth, between the ages of 16 and 24, are considered “disconnected”—lacking the social, academic, and employment connections that lay the foundation for a successful future. Some are high school dropouts. Others may be unsuccessful in making workforce connections due to family obligations, lack of marketable employment skills, substance abuse, homelessness, incarceration, disability, or difficulty aging out of the foster care system. On June 8, 2009, JOTF held a forum to explore these issues. The forum was hosted by the Baltimore Community Foundation, and drew a crowd of nearly 50 engaged service providers, educators, advocates, funders and government leaders. Andrea Payne provided an overview of JOTF’s latest Issue Brief A Young Workforce At Risk: Reconnecting Out-of-School and Out-of-Work Youth in Maryland. Payne gave details on the extent of youth disengagement in the state and discussed JOTF’s recommendations for re-connecting young Marylanders to school and work. The panel also included two practitioners from the field, who spoke about their programs targeting disconnected youth in Baltimore. Ernest Dorsey, Director of the Baltimore Youth Opportunity (YO!) program, discussed YO’s efforts to help City youth move into education and career preparation. Stephanie Region, Director of Living Classrooms Foundation’s Fresh Start Program, gave an overview of their work providing job training and academic development to out-of-school youth, largely referred through the Department of Juvenile Services. In 2007 and 2008, the Maryland General Assembly passed a series of new laws that reduce barriers for ex-offenders. These laws changed Maryland’s approach to criminal record expungement, and created the nation’s first Child Support Incentive program. On February 20, 2009, JOTF hosted a forum to share details on how these changes are being implemented and how they can improve outcomes for ex-offenders. The forum was sponsored by the Open Society Institute, and featured speakers from the Homeless Person’s Representation Project (HPRP) and the Maryland Department of Human Resources (DHR). First, Carolyn Johnson from HPRP discussed two new expungement laws. The first, passed in 2007, mandates the automatic expungement of arrests without charge. Employers are often reluctant to hire job applicants with criminal records, which list not only convictions, but nearly all non-conviction dispositions. Before the passage of this law, that included arrests. Often individuals are arrested, but never charged with any kind of crime. This new law ensures that when someone is not charged, it will not negatively impact their employment prospects by putting a black mark on their record. Since the process is automatic, there is no cost or paperwork required for this type of expungement. Ms. Johnson also shared the details of a 2008 law that makes it possible to expunge convictions for minor nuisance crimes, such as loitering or panhandling. Many of these nuisance crimes are associated with homelessness. No other convictions, including crimes related to drugs, theft and violence, are currently eligible for expungement. Under the new law, ex-offenders may apply for a nuisance crime expungement after a 3-year waiting period. HPRP and the Maryland Volunteer Lawyer Service can help low-income residents with the process. The new law can help those with minor convictions to clean up their record, and improve their employment prospects. Representatives from DHR’s Office of Child Support Enforcement discussed the Child Support Incentive program, passed into law in 2007 and implemented in 2008. The program encourages non-custodial parents to make their court-ordered child support payments by offering the opportunity to eliminate state-owed arrears. Thousands of low-income non-custodial parents have accumulated unpayable child support debt as a result of a change in their economic status, such as joblessness or incarceration. This debt is owed to the state because custodial parents who receive public assistance benefits are required to sign over child support rights to the state. This debt is often overwhelming, and serves as a disincentive for debtors to engage in mainstream work, since the principal collection method is wage garnishment. The new program encourages non-custodial parents to find legitimate employment and do right by their children. If participants remain current on their existing child support orders for two years, the state will gradually eliminate state-owed debt. On January 13th, JOTF and the Baltimore CASH Campaign co-hosted a forum to give service providers and advocates information on tax credits and free tax preparation services available to low-wage working families. A group of about 50 representatives from non-profit and government agencies around the region attended to get informed and collect materials to distribute to clients. Also important this year is the Economic Stimulus payment that most taxpayers received in Spring or Summer of 2008. Those who did not receive the payment last year can receive a Recovery Rebate Credit on this year’s tax return. The credit is worth anywhere from $300 to over $1200, depending on income and family size. The credit is available to anyone who earned more than $3000 in 2008. In addition to federal credits, families are also eligible for a state EIC, which was recently increased from 20% to 25% of the federal EITC and expanded to cover low-wage workers without dependents. Also of note here in Maryland is the upcoming Money Power Day—a free financial wellness fair taking place March 21, 2009 at the Baltimore Polytechnic Institute. With foreclosure rates on the rise across the U.S., the media, state legislatures, and advocates have focused intensively on how this impacts homeowners. Less attention has been paid to the impact on renters, though there is growing anecdotal evidence that renters are being displaced when their home is foreclosed. On June 25th, JOTF, the Baltimore CASH Campaign, and the Baltimore Homeownership Preservation Coalition co-hosted a forum to start a conversation around the issue. The event featured two Senior Researchers from the Urban Institute. Tom Kingsley and Robin Smith presented information on national trends, described challenges other communities are facing, and provided a national context for the next wave of the foreclosure crisis. Attendees discussed the status of housing policy in Maryland, and how this impacts local renters. Over 1.3 million working-age Marylanders lack a college degree, and more education could help many of them move into high-demand, better-paying jobs. Maryland colleges strive to provide these opportunities to students from all backgrounds, but major barriers stand in the way. With high tuition and limited need-based financial aid, cost is often a gatekeeper, particularly for working adults. Students who do enroll are often under-prepared, and struggle to move past developmental coursework. On June 17th, JOTF held a forum to discuss the workforce development role of local community colleges, and the strategies for moving students more smoothly through the education pipeline and into the workforce. Patty Keeton, Executive Director of Workforce Development at Howard Community College, provided an overview of the work done by community colleges, ranging from degree programs to contract training. Andrea Payne, Policy Analyst at JOTF,discussed the barriers facing Maryland students, as described in JOTF’s latest Issue Brief, Patching the Leaky Pipeline: Helping Low-Skill Marylanders Access & Succeed in College. Deborah Peoples, Director of Continuing Education at Baltimore City Community College, and Donna McKusick, Dean of Developmental Education at the Community College of Baltimore County, followed with an overview of promising practices for moving students ahead—both through student supports, and non-traditional approaches to developmental education. Research shows that minority neighborhoods have much higher shares of subprime or high cost mortgage loans than comparable white neighborhoods. However, since the data reported by lenders do not include information on the credit risk of borrowers, it was unclear whether the disparity could be explained by differences in the credit profile of these neighborhoods. On May 28th, JOTF and the Baltimore CASH Campaign co-hosted a forum to share new research on the issue. Dr. Christopher Herbert, a Senior Associate with Abt Associates Inc., presented the findings of a new study funded by the Annie E. Casey Foundation. Dr. Herbert’s research used Experian data for 13 cities targeted by Casey Foundation initiatives (including Baltimore) to assess racial/ethnic disparities in mortgage lending while controlling for credit scores. The goal of the analysis was to identify the extent of any racial disparities in local communities and to identify lenders that could be encouraged to increase the flow of lower cost mortgage credit in these areas. Advocates and researchers from around the area gathered at the Baltimore NeighborWorks America office to learn more about the findings, ask questions, and share thoughts on how to bring fairer, more affordable loan products into low-income and minority communities. • Emmett McGee, a partner from DLA Piper discussed liability issues in hiring and retaining employees (including people with a criminal background). Mr McGee discussed the concept of negligent hiring and ways in which employers could ameliorate their exposure to liability concerns. • Amelia Lazarus, Esq. of the Homeless Person’s Representation Project described how to accurately read and interpret a criminal background check. On January 10th, 2008, JOTF and Baltimore CASH Campaign presented “Making Tax Time Pay: How the Earned Income Tax Credit Benefits Working Families.” The annual workshop gave local service providers and advocates the information they need to help ensure their clients take advantage of all the tax credits they are entitled to. The most significant credit most low-income families can claim is the Earned Income Tax Credit (EITC). The EITC was created in 1975 to encourage employment among low-income workers, reduce their tax-burden, and supplement their wages. Yet many working families are not aware of this benefit, or remain unsure about how to claim it. Through education and outreach about the EITC, workforce development agencies and other community-based organizations can help boost family incomes, promote mainstream employment, and stimulate local economies. Pam Chaney, the CASH Campaign’s Operations Director, discussed the benefits and eligibility criteria for the most relevant tax credits, and Kristal Lukacs gave an overview of free tax services available to low-income Baltimore area residents. The Annie E. Casey Foundation generously provided space for the event. To learn more about available tax credits and free tax services, click here to view power point presentation: “A Campaign for Working Families”. Click here for the Baltimore CASH Campaign 2008 Informational Flier in PDF format. Provides a listing of free tax prep sites around Baltimore and details for clients seeking assistance. Click here for the EITC Informational Flier in PDF format. Gives clients the information they need on claiming the valuable Earned Income Tax Credit. These and other promotional materials are available in English and Spanish from the Baltimore CASH Campaign. On May 16, 2007, the Job Opportunities Task Force co-hosted a lunchtime forum with the ReEntry of Ex-Offenders Clinic at the University of Maryland School of Law. The discussion focused on removing from city job applications the box where applicants are asked to check “yes” or “no” to indicate if they have ever been convicted of a crime. It is important to note that banning the box does not require the employer to hire anyone, nor does it prohibit the employer from conducting a background check prior to the job offer. To date, nine cities around the country have implemented the policy, while ten others are currently considering the measure. Banning the box helps to reduce employment discrimination against people who have been convicted of a crime, and increases the likelihood that qualified individuals will be given the chance to interview and present themselves before having to divulge background status. Rudolph also explained the precise steps that have been taken by the City of Chicago. City job application forms no longer require applicants to disclose convictions, and therefore information regarding criminal history does not affect the determination of whether the applicant possesses the skills and qualifications necessary to satisfy eligibility requirements. Criminal backgrounds are investigated only after the applicant has been determined to meet eligibility requirements and is actively being considered for hire. As a result of these changes, applicants are no longer automatically disqualified based solely on criminal background status. The forum was co-sponsored by the Open Society Institute – Baltimore and JOTF. Homeownership is often touted as the most effective opportunity to build wealth over a lifetime. However, working families often find themselves overextended and unable to protect their home in times of job loss, illness, or family strife. In light of the increasing costs of housing, the devastating impact of foreclosures, and the prevalence of predatory lending, are we pushing families too far? On March 23rd, JOTF, the Baltimore CASH Campaign and the Maryland Asset Building Initiative co-hosted a forum to explore these issues. This forum was the third event in the High Cost of Being Poor Lunchtime Discussion Series. The discussion featured Barbara Aylesworth, Executive Director of Belair-Edison Neighborhoods, Inc. and Lindley R. Higgins, PhD, Applied Research Manager for NeighborWorks® America. Approximately 40 local non-profit, government, and housing industry workers attended the brown-bag event. The group discussed issues such as preparation for homeownership, foreclosure prevention, and the direction of the sub-prime lending market. The forum took place at the Mid Atlantic District Offices of NeighborWorks® America. On February 16th, JOTF co-hosted another sold-out installment of the High Cost of Being Poor Lunchtime Discussion Series with the Baltimore CASH Campaign and the Maryland Asset Building Initiative. This month’s forum explored the high cost of getting to work, and focused on strategies for increasing the mobility of low-wage workers. Transportation is one of the key barriers to finding and keeping a steady job. This is especially true in Maryland, where almost half of all workers must travel to another county for their job. This places a heavy burden on low-wage workers. The public transit system has serious gaps, but the expense of buying and maintaining a car often places this option out of a low-income family’s reach. Henry Kay and Margy Waller opened the discussion with thoughts on the key transportation barriers facing low-wage workers. Kay is Director of the Greater Baltimore Committee’s Baltimore Transit Alliance & former Planning Director for the Maryland Transit Administration, and Waller is Director of The Mobility Agenda and Co-Founder of Inclusionist.org. The event took place at the Baltimore City Community College. For the second tax season in a row, JOTF partnered with the Baltimore CASH Campaign to host “Making Tax Time Pay: How the Earned Income Tax Credit Benefits Working Families.” The sold-out event took place on January 9th, 2007. This annual workshop gives local service providers and advocates the information they need to help ensure their clients take advantage of all the tax credits they are entitled to. Joanna Smith-Ramani, Director of the Baltimore CASH Campaign, gave an overview of the initiative and the free tax services available to low-income clients. Pam Chaney, the CASH Campaign’s Operations Director, discussed the benefits and eligibility criteria for the most relevant tax credits. The Annie E. Casey Foundation generously provided space for the event. Nearly half of all private U.S. workers receive no paid sick leave. Only one-third of those who do have sick leave can use their days to care for sick children. Most workers have no choice but to take unpaid time off, and some risk losing their job for these unexpected absences. Here in Maryland, and in other states across the country, advocates and policymakers are working to address the problem. JOTF hosted a forum on October 11 at Baltimore City Community College to discuss the issue. A panel of three national experts led the conversation. Vicky Lovell, Director of Employment and Work/Life Programs at the Institute for Women’s Policy Research, gave an overview of what we know about paid leave—who gets it and who does not—and the impact this has on workers, families, employers, and communities. Jodie Levin-Epstein, Deputy Director of the Center for Law and Social Policy (CLASP), discussed legislative design and strategies for addressing the problem. Kate Kahan, Director of Work & Family Programs at the National Partnership for Women and Families, described what is being done in other states and how to address opposition to sick leave policies. Can America’s Low-Wage Workers Still Achieve the American Dream? Panelists included: Jason Perkins-Cohen, Executive Director of the Job Opportunities Task Force; Jo-Ann Williams, Human Resources Manager for the University of Maryland Medical Systems; Dwayne Drake, Sr., current Lead Tech Central Pharmacy at the University of Maryland Medical Center and former minimum-wage worker; and Anirban Basu, Chairman and CEO of Sage Policy Group, Inc.
WBAL Investigative Reporter Jayne Miller moderated the discussion. On September 19, 2006, JOTF co-sponsored a policy luncheon focusing on the challenges facing America’s low-wage working families and how communities, policymakers and business leaders can make a difference. The event featured a screening of “Waging a Living: Opportunities for Action,” a 26-minute policy version of a new documentary funded by the Annie E. Casey and Ford Foundations. The film follows the lives of three low-income workers and their struggles to pay for health care, access continuing education, afford decent housing, and still make ends meet. Although these individuals work hard, they face numerous barriers to advancement and self-sufficiency. For Jean Reynolds, a single mother caring for a daughter with cancer, not even working overtime at her job as a Certified Nursing Assistant is enough to pay the family medical bills, much less leave her time to increase her education. Barbara Brooks, a single mother struggling to balance family and school, finds that the harder she works, the less public support she receives, and the more she must cut corners to get by. While Jerry Longoria works full time as a security guard in San Francisco, his wages cannot cover the high local cost of living, and his lack of skills leave him little hope for advancement. One in four American families face the challenges of being low-income, and the screening was one step in stimulating a local conversation around the issue. Scot Spencer, Manager of Baltimore Relations at the Annie E. Casey Foundation, gave a welcoming speech to a crowd of nearly 200 attendees. U.S. Congressman Elijah Cummings, the host of luncheon, followed with opening remarks. After the film, a panel discussion addressed the obstacles facing low-income workers and changes that can be made to help these families achieve the American Dream. Co-sponsors of the luncheon included the Annie E. Casey Foundation, Maryland Public Television, the Association of Baltimore Area Grantmakers, and the Reginald F. Lewis Museum of Maryland African-American History and Culture. Click here for more information on the documentary “Waging a Living”. If you would like a copy of the film please contact Jessica Traskey at (410) 234 8040. With the high attendance numbers and interest of JOTF’s recent forum “Can America’s Low-Wage Workers Still Achieve the American Dream?” JOTF have decided to take on the road the short 26 minute policy version of the documentary “Waging a Living: Opportunities for Action” with informal discussion. Sponsors: Baltimore Workforce Investment Board, Greater Baltimore Committee, Open Society Institute, Maryland Department of Business and Economic Development, and the Job Opportunities Task Force. Maryland employers are interested in hiring ex-offenders but want to know more about the risks and rewards. This was one of many important messages revealed at a July 17 th forum that brought together over 60 employers, business groups, government officials and workforce development leaders. Forum participants discussed the issue of hiring ex-offenders and brainstormed ways to increase workforce opportunities for people with criminal backgrounds. The forum was co-sponsored by the Job Opportunities Task Force (JOTF), the Greater Baltimore Committee, Open Society Institute – Baltimore, the Maryland Department of Business and Economic Development and the Baltimore Workforce Investment Board. Secretary Aris Melissaratos of the Department of Business and Economic Development stressed that Maryland will need large numbers of additional workers – particularly in such fields as construction and hospitality – and can not afford to write off thousands of ex-offenders. “To meet its workforce needs, Maryland must do more to prepare people in prison to re-enter society and the workforce,” he said. John W. Ashworth III, senior vice president of the University of Maryland Medical System and chair of the Baltimore Workforce Investment Board, also stressed the importance of tapping into the ex-offender population to fill critical workforce needs. About a third had knowingly hired ex-offenders. The rest either did not know the criminal backgrounds of their applicants or chose not to hire ex-offenders. A majority were unaware of tax breaks or bonding programs that are designed to encourage the hiring of ex-offenders. The top concerns about hiring ex-offenders were liability issues and employee drug use. A large number were concerned about hiring people with convictions for violent crimes. The forum included break-out sessions during which small groups identified key concerns that prevent employers from hiring ex-offenders, as well as steps that would encourage employers to consider such hires. One key finding was the need to educate employers, particularly human resource officials, about ex-offenders – a “nuts and bolts” guide to what the risks are and what programs are available to help employers. One employer mentioned that having a case manager or job coach from a community-based organization to work with ex-offenders would be a significant help. Such training or assistance would help employers conquer their “fear of the unknown,” said Felix Mata, project director with the Baltimore Mayor’s Office of Employment Development. “A lot of them have not hired an ex-offender and don’t know what to expect,” Mata told the forum participants. Several of the small groups also stressed the need to provide training and other services to people while they are incarcerated, to prepare them for the transition back to society and the workforce. Mary Ann Saar, secretary of the Maryland Department of Public Safety and Correctional Services, urged those at the event to support efforts to expand such services for inmates. The General Assembly has approved pilot initiatives in these areas, but has not funded a statewide program. “This is the kind of thing that needs to be done,” Saar said. She also thanked employers who have hired ex-offenders. “By hiring people with criminal backgrounds, you are giving them a chance to support themselves. But you are also sending an important message to other employers that these are good employees worthy of being hired,” Saar said. One of the state’s largest employers, Johns Hopkins Hospital, has been a leader in hiring ex-offenders, putting about 100 on the payroll in six years. “We can say, as an employer, we have had excellent results [hiring ex-offenders] but we recognize it’s merely a drop in the bucket,” said Ron Peterson, president of Johns Hopkins Hospital, where the event was held. Don Fry, president of the Greater Baltimore Committee, said his organization has focused extensively on the issue of helping ex-offenders obtain employment. “We support efforts to remove barriers to employment,” Fry said, including expanded drug treatment and job training. Speakers: Diane Bell McKoy, Senior Fellow with the Casey Foundation; Lisa Evans, Deputy Director of St. Ambrose Housing Aid Center; Robin McKinney, Assistant Director of the East Harbor Community Development Corporation and Christopher Tan, Program Officer for Local Initiatives Support Corporation in Chicago. Moderator: Deborah Owens, host of Moneyworks on WEAA 88.9 FM and author of Confident Investing: A Wealth Building Guide for Women and Nickel and Dime Your Way To Wealth. While many low-income Marylanders are going to work, data suggests that most still have trouble making ends meet and even more have difficulty saving money for a car, home or college. Deborah Owens believes that people aren’t really ready to make a significant change in their life until they undergo what she calls an “emotional pivot.” According to Deborah, this is the moment in which they can see the path to a better life and success becomes real to them. In order to help people reach that emotional pivot, we may need to change our own way of thinking. For example, if a person is motivated to invest, it may be better to encourage them to do so and allow them the opportunity to watch their investments grow then to focus exclusively on debt reduction. “Having a more robust African-American middle class in Baltimore must be our agenda,” said Diane Bell McKoy. The share of African-Americans joining the middle class has stagnated over past decades. Without a prosperous, well-educated middle class, Baltimore will not generate enough wealth to remain economically competitive, nor will the city be able to meet obligations to seniors and other critical public needs. Research conducted by the Casey Foundation reveals that race does matter in wealth creation. Baltimore’s communities continue to be in jeopardy, with 65% of Baltimore’s African-American citizens earning less than $35,000 per year. Robin McKinney agreed with Deborah Owens on the need for an emotional pivot. Because Robin’s clients are often overwhelmed by the thought of saving for a house, she challenges them to make changes in their lives in brisk, seven-day increments. By asking, “What are you going to do differently in the next seven days?” she is able to help clients see their progress immediately. Robin also stressed the importance of individual development accounts (IDA). Though eligibility requirements are tough, these matched savings accounts prove invaluable for those who can obtain them. Service providers should learn how to take advantage of the numerous IDA slots currently sitting empty in Baltimore City. St. Ambrose Housing Aid Center provides pre and post-purchase homeownership education so that individuals who are able to buy houses can keep them. According to Lisa Evans, more and more low-income people are falling victim to predatory real estate practices, especially as lenders continually put buyers into higher interest loans where they do not belong. In addition, unknowing first-time homebuyers find themselves at risk when they think they have a fixed loan, but then get to settlement and learn at the last minute, when it is already too late, that they do not. Christopher Tan views asset building as a non-linear process. At the Local Initiatives Support Corporation in Chicago, caseworkers help clients through a long-term, gradual process. During year one, clients focus not so much on saving money as on lowering their asset depleting activities. The actual asset building process does not begin until the second year of their casework. Christopher also stresses the need for service providers to understand that every situation is different. People living paycheck to paycheck have a need for immediate liquidity because they cannot rely on credit. As a result, there is a demand and supply side to payday lending. The Earned Income Tax Credit (EITC) was created in 1975 to encourage employment among low-income workers, reduce their tax-burden, and supplement their wages. Yet many working families are not aware of this benefit, or remain unsure about how to claim it. Through education and outreach about the EITC, workforce development agencies and other community-based organizations can help boost family incomes, promote mainstream employment, and stimulate local economies. View the CASH Campaign PowerPoint presentation on tax credits that help working families. The Baltimore CASH (Creating Assets, Savings, and Hope) Campaign is a coalition of nonprofit organizations, businesses, local government agencies, the IRS, and philanthropic foundations dedicated to: informing low-income workers about the significant cash benefits of the Earned Income Tax Credit; Providing high quality, free tax preparation services; Linking clients with asset development opportunities such as financial literacy classes, savings programs, and mainstream banking opportunities. Since 2001, the Campaign has helped City residents claim over $7 million in EITC payments. Organizations should not “chase funding” by changing programs’ structure or goals to fit with the guidelines of a particular grantmaking program or request for proposal (RFP), but instead bid only on those funding programs that constitute a good fit with their existing programs and capacity. Grant seekers should already have a clear sense of their own goals and capacity, as well as a solid understanding of the problem that an RFP hopes to address. If a provider grasps the problem, but lacks a solid sense of exactly how its program can address that problem, the provider should not respond to an RFP. Careful research of a foundation’s grantmaking priorities and of the problem at hand can enhance a grant seeker’s chances of receiving funding. It is important to be knowledgeable about the particular philosophy and funding style of particular foundations, since different funders have different orientations. Some g rantmakers will refer applicants to other funders if not an applicant’s program does not fit within a foundation’s grantmaking areas. The Abell Foundation is open to receiving proposals from startup organizations, whereas other funders tend to only make grants to established nonprofits. Some foundations respond to unsolicited funding applications, while others extend invitations for nonprofits to apply. Collaboration – What is the organization’s strength, and is it open to partnering with other organizations to supplement its capacity? Replication – If the program is successful, can it be duplicated elsewhere or on a different scale? Focus on systemic change – Applicants should “tell their stories” about how their programs fit with the foundation’s broader societal goals. Many funders expect providers to be partners in the work; however, the reality is that the playing field is not level. Providers should be up front about their strengths and weaknesses and not “over-promise and under-perform,” as this can quickly sour a grantmaker-grantee relationship. Providers should involve program staff in the proposal process, since front-line personnel have a distinct perspective on the strengths and weaknesses of the program, and of the problem the program seeks to address. Funders “live vicariously” through their grantees. Program officers must report to their boards to justify their recommendations for initial or ongoing funding, and to report on grantees’ performance. Grantees can help program officers help them by maintaining communication that is both open and honest. The best way is to accomplish this is through regular contacts in person and by phone, beyond those mandated by the grant reporting requirements. Grantees should be forthright about whatever challenges they are facing as they seek to implement the terms of the grant; this enables funders to address problems before they grow too large. Site visits are another good way for funders and their boards to become more familiar and comfortable with grantees and their programs. Developing partnerships: effective collaborations with other organizations can increase a grantee’s ability to fulfill the conditions of the grant and help the funder achieve its own systemic reform goals. This is particularly true in the area of public policy advocacy, because of the federal restrictions on lobbying by nonprofits. Reports are “not just a way to get more money,” or to abide by the terms of a grant. The reporting process should help providers build on strengths, alleviate weaknesses, and measure outcomes. Reports should include both quantitative and qualitative outcomes, as well as shorter-term results. In addition to their assessment of a program’s long-term outcomes, foundations also pay attention to interim benchmarks, such as the number and type of constituents reached by newsletters and other public education efforts. Foundations have other resources to offer besides money. They also can be valuable sources of research, technical assistance, organizational development expertise, and knowledge of different programs that work to address the same problem. Grantees should feel comfortable asking program officers about other types of assistance available besides funding. As a rule, grantmakers will not fund organizations indefinitely. While some foundations will provide multi-year grants or issue renewals of single-year grants, grantees must take steps to develop alternate sources of funding. Demonstrated efforts to seek out new revenue streams and leverage existing ones can be a significant method of instilling faith in a funder that a grantee is healthy, stable, and sustainable. Because of this, it is critical for grantees to have integrity in their ongoing relationships with funders. The foundation community is a relatively small one, meaning that a grantees reputation – for better or for worse – will precede it as it looks to expand its sources of income. It is rare for a foundation to rescind grant funding (this only happens about 10 percent of the time), but a failed relationship between grantmaker and grantee can severely impact the likelihood that an organization will receive new funding. In order to foster and maintain positive relations with funders, development officers should be knowledgeable and passionate about the work of the grantee organization. Nonprofit CEOs should ensure that the staff member or contractor in charge of fundraising is familiar with their organizations’ mission, vision, and operations. Some programs pose more of a challenge to ongoing funding. GED and literacy programs, for example, often experience difficulty in sustaining funding levels because outcomes are difficult to measure and depend on a host of variables. Guidestar (http://www.guidestar.org): An online database or information and resources for grant seekers, funders, and others in the nonprofit sector. Guidestar E-Docs (http://www.guidestar.org/help/faq_edocs.jsp): An online subscription service that allows nonprofits to upload their most recent Form 990’s, letters of determination, annual reports, audited financial statements, and other documents. Chronicle of Philanthropy (http://www.philanthropy.com): News, resources, and other information about grantmaking in the nonprofit sector. Nonprofit Good Practice Guide (http://www.npgoodpractice.org): A project of the Dorothy A. Johnson Center for Philanthropy and Nonprofit Leadership, this online guide offers information about preferred practices, pitfalls, and nonprofit trends within 10 topic areas. Raising the Minimum Wage: Good for Maryland? Sparks flew when JOTF hosted a lively debate on the minimum wage that featured two of the country’s top economists. Jared Bernstein of the liberal Economic Policy Institute argued that an increase in the minimum wage is necessary to even the economic playing field for low-wage workers. Tim Kane of the Heritage Foundation, a conservative think tank, countered that raising the minimum wage would hurt the American economy. Decide for yourself: listen to an online audio recording of the debate in its entirety. Presenters: Sarah Griffen, Boston Healthcare and Training Institute; Tara Webb, Impact, Inc.
Industry Representatives: Nat Alston, the Horizons Group; Mary Jo Gubricky and Frederick Kline, Aramark; Rick Silber, City Group. Based on the success of its workforce practitioners’ forum, JOTF organized a daylong workshop to address in a more in-depth manner some of the areas of interest listed by May 11 attendees. To help plan the session, JOTF reached out to Public/Private Ventures, a New York-based nonprofit organization that conducts research into and training around social policy issues, including workforce development. Using its publication Job Development Essentials as a template, P/PV developed a curriculum that focused on effective communications between service providers and employers. Sarah Griffen of the Jamaica Plain Neighborhood Development Corporation in Boston, and Tara Webb of the nonprofit Impact, Inc. in Philadelphia were contracted by P/PV to conduct the workshop. designed the curriculum to maximize participant input. An afternoon panel featured representatives of key industry sectors, including hospitality and construction. Employers on the panel discussed typical business needs and concerns, and how providers could best address them. Following the panel presentation, each employer led small groups of participants in practicing and refining their marketing pitches. As with the May 11 event, response from attendees was overwhelmingly positive. Many expressed a hope that JOTF would provide further opportunities for them to continue exploring some of the topics discussed at the workshop. Speakers: Chris Thompson, Senior Research Associate, Johns Hopkins University Institute for Policy Studies; Bernard Antkowiak, Assistant Secretary, Maryland Department of Labor, Licensing and Regulation; Marguerite Walsh, Dean of Intensive Training, Community College of Baltimore County. 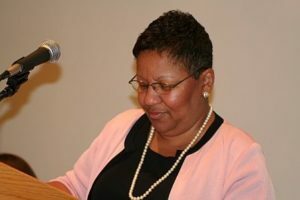 Moderator: Patrice Cromwell, Committee and Associate Director, Open Society Institute—Baltimore and Co-Chair, BWIB Workforce System Effectiveness Committee. Chris Thompson presented findings and recommendations of the new report, Baltimore’s Workforce System at Work, of which he is the lead author. Released by the Baltimore Workforce Investment Board (BWIB), this report is the first in-depth study of who is using Baltimore’s workforce training programs; the programs’ levels of success; and how they measure up against initiatives in other comparable cities. BWIB is the private sector-led group appointed by Mayor Martin O’Malley to oversee investment of federal workforce funds. Much of the funding for workforce development programs in Baltimore falls under the federal Workforce Investment Act of 1998 (WIA), which established Workforce Investment Boards (WIBs) at the state and local levels. The report defines “training” as WIA-subsidized customized training administered by the Mayor’s Office of Employment Development in partnership with employers in specific industries, or training available to workers with Individual Training Accounts (ITAs). An ITA is an occupational skills training voucher that can be used by a job seeker who has completed core and intensive employment services through their local Career One-Stop Network. ITAs are accepted by an eligible training provider approved by the state. Baltimore’s Workforce System at Work shows that when evaluated against comparable cities, Baltimore’s WIA-funded workforce efforts score highly on nearly all federal performance measures, yet those measures only tell part of the story. Compared to cities of similar sizes, Baltimore places more people in jobs, but most of these workers have only gone through One-Stop Career Center core employment services, as opposed to customized training. The report also shows that the city’s training programs are have a strong return on taxpayers’ investment after two years. Yet despite their success rate, these programs are severely under-funded as the federal grants used to support them continue to shrink even as the city’s unemployment rate remains high. More funds are needed so that Baltimore’s workforce system can expand its menu of training options and increase the number of people who can access these opportunities and improve their earning potential. Given that training produces positive results for job seekers and taxpayers, the report raises the question of how Baltimore can devote more resources to training. Baltimore’s Workforce System at Work calls on the city to solicit additional public and private funds to increase significantly the numbers of people trained as quickly as possible. For more information about the findings and recommendations of the report, see the PowerPoint presentation above. To request a copy of Baltimore’s Workforce System at Work, contact Dr. Thompson at (410) 516-8740. Bernard Antkowiak pointed out the difficulties in ascertaining the precise sources and uses of workforce funding coming to Baltimore and the state. He remarked that since the report only addresses WIA funds, it fails to address other types of federal funding (such as Wagner-Peyser]) that supports workforce programs in Baltimore. Mr. Antkowiak said that Maryland experienced a $4.3 million decline in WIA funding, not because of federal rescissions, but because Maryland’s economy is improving, and therefore receives a smaller share of WIA allocations. Another factor affecting workforce funding to Baltimore is demographic shifts over the past several years; Baltimore has lost residents, while jurisdictions like Prince George’s County have expanded. He also cautioned that training is not for everyone, saying that many employers are simply looking for a reliable employee who can be trained on the job to suit the specific business. Additionally, the choice between full-time training and immediate job placement is a difficult one for job seekers who require income in the short term. Mr. Antkowiak called for employers to exercise flexibility in employees’ schedules, so that workers are able to take time off for training. Marguerite Walsh called for greater collaboration among all stakeholders in workforce development. Emphasizing that workforce development is entwined with economic development, she urged employers, trainers, and placement agencies to develop a regional perspective and to keep demographic information in mind when designing employment and training programs. Ms. Walsh cited the need for reform of the k-12 educational system, since elementary and secondary schools are not doing enough to prepare young people for the workforce. Panelists: Diane Bell, President and CEO, Empower Baltimore Management Corporation; Tammy Ditzel, Training Director, Maryland Institute for Employment and Training Professionals; Michael Gaines, President & CEO, Maryland Center for Arts & Technology; Brian Lyght, Senior Associate, Annie E. Casey Foundation; Sara Muempfer, Workforce Network Manager, Maryland Works; Marion Pines, Senior Fellow, Johns Hopkins University Institute for Policy Studies; Karen Sitnick, Director, Mayor’s Office of Employment Development and President, Maryland Workforce Development Association; Melanie Styles, Program Officer for Workforce Development, Abell Foundation. Keynote speaker: Leon Thomas, President, YCDI Hospitality, Inc.
Marion Pines said that what is referred to as the “workforce development system” in fact comprises a variety of different fields, including employment and training, public safety, social services, education, and economic development. In addition to job seekers, incumbent workers, and employers, the types of individuals involved in workforce development include job developers, retention specialists, trainers, educators, and case managers. While these seemingly disparate professionals have a common mission with regard to workforce development, too often they do work with each other as well as they could. Among the reasons for this lack of collaboration are turf, tradition, separate funding streams, grant reporting requirements, and internal rules and regulations. Yet collaboration among organizations is increasingly important, given the dwindling amount of public resources available for workforce development programs. • Commitment to the client. • WIA funding to Baltimore dropped approximately 20 percent between 2000 and 2004, from $11 million to $9 million. • Youth Opportunity Grant declined from $11 million to $8.3 million during the same period, and will expire in 2005. • Welfare-to-Work funding ended in January 2004. • Empowerment Zone funding, which Baltimore received as a $100 million federal block grant in 1994, must be spent by January 2005. The Workforce System Effectiveness Committee of the BWIB recently conducted a study that found that job training is cost-effective and produces generally positive results for trainees, with a wage gain of $3.55 for every dollar spent on customized training (training that helps participants find skilled careers in specific industrial sectors, such as health care) programs and $1.49 for every dollar spent on training vouchers (Individual Training Accounts or ITA’s). Karen Sitnick stressed the importance of properly trained workforce professionals in delivering high quality employment and training services. 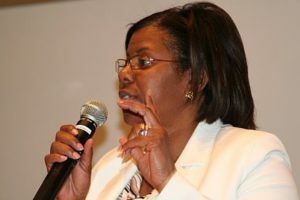 As director of the Mayor’s Office of Employment Development (MOED), she has ensured that all career counselors at MOED One-Stop receive Global Career Development Facilitator (GCDF) certification. She also helped establish the Youth Practitioners’ Institute (YPI), and has worked to make certain that all Youth Opportunity counselors working for the city are certified by YPI. YPI is a collaborative endeavor involving MOED, Baltimore City Community College, and the Sar Levitan Center for Social Policy Studies at Johns Hopkins University. YPI was created to teach youth workers about youth development and give them an understanding of how to find additional funding and resources. Tammy Ditzel explained that like many workforce development practitioners, she received no formal training when she began working in the employment services field. She encouraged participants to identify mentors who could help them bridge gaps in skills. The Maryland Institute for Employment and Training Professionals (MIETP) offers workshops and a menu of customized training opportunities to help meet the specific needs of workforce practitioners and organizations. The certification programs offered by MIETP are GCDF training, Certified Workforce Development Professional (CWDP) training, and Federal Job Search Trainer certification. These programs are explained in more detail below. GCDF is a professional certification program for career counselors, job developers, case managers, career coaches, career center staff, trainers, job coaches, employer reps, outplacement staff, and interviewers. To satisfy the educational requirements for GCDF certification, a full 120-hour course of instruction that meets the criteria established by the Center for Credentialing and Education must be completed. The course consists of 108 hours of classroom instruction over 17 days (approximately 2 days per month), with another 12 hours of outside research, assignments, activities, and real-life applications. Coursework taken as part of GCDF certification can be applied to meet the requirements for Certified Workforce Development Professional certification (see below). GCDF certification involves coursework in the following competency areas: Workforce Development History and Policy; Helping Skills; Labor Market Information and Resources; Assessment; Diverse Populations; Ethical and Legal Issues; Career Development Models; Employability Skills; Training Peers and Clients; Program Management/Implementation; Promotion and Public Relations; Technology; and Consultation. The cost is $1,395 for MIETP partners (Public workforce agencies), and $1,995 for non-partners. 2. By applying directly to NAWDP (application packets are available at NAWDP’s website). An application fee is charged. MIETP awards a “Certificate of Competence” for individuals who complete this 3-day program. The course equips career development professionals and trainers with the skills, knowledge, and resources they need to help their job seekers find and obtain employment opportunities with the federal government. Opportunities are also available for professional consultants and trainers to work through MIETP to deliver the certification training to direct service staff. Sara Muempfer described the many different types of people who need workforce development services of some variety. These populations include inmates and ex-offenders, foreign-born workers, employers, young people, substance abuse treatment recipients, and others. This offers workforce development professionals a broad range of career options, depending on the skill areas they choose to cultivate. Ms. Muempfer encouraged attendees to continuously seek opportunities to improve their skills in the profession, and urged managers of workforce programs to invest in training for their workforce staff. • The Provider Network is comprised of nonprofit community based organizations that offer employment and other supports that help people get back to work. • The Workforce Network is made up of a wide range of workforce development, job development, and other career counseling professionals. • The Rehabilitation & Employment Program creates quality employment opportunities for individuals with disabilities, while providing the State of Maryland with high quality services and commodities. 2. How can we measure if our customers are better off? 3. How can we measure if we’re delivering services well? 4. How are we doing on the most important of these measures? 5. Who are the partners that have a potential role to play in doing better? 6. What works to do better? Michael Gaines urged employment and training providers to consider how they can best respond to employers’ needs, since along with job seekers, businesses are the most important stakeholders in workforce development. At the same time, employers have a responsibility to the community and to their employees. Service providers should encourage employers to clearly articulate the needs of their businesses, so that the providers can adequately respond to them. Diane Bell recommended that attendees examine their organizations’ respective goals, objectives, and cultures. It is also important for programs to develop and analyze hard data about their service populations, their staffs, and the effectiveness of their services. This self-assessment can help an organization go beyond the assumptions it makes about its own work and performance. • Goals must be regularly reviewed and changed if necessary to ensure continuous improvement. Keynote speaker Leon Thomas applauded forum participants for their efforts to help job seekers find and keep rewarding employment. He told the story of his own career progress, beginning as a bellman at a small hotel and rising through the ranks to become general manager of a 300-room convention hotel in downtown Philadelphia. Each hotel that he managed saw increased revenues, lower expenses, higher guest satisfaction scores, and improved job retention rates among employees. As director of training and task force operations for Vista Host Hotel Management Corporation, Mr. Thomas was responsible for improving the outcomes of under-performing hotels across the country by working with hotel managers to improve retention rates, train frontline associates, and help new hotels establish operating procedures. He attributed his success as a manager and trainer to his focus on creating lively work environments, being flexible with staff work schedules, and simply letting his employees know what tasks needed to be done, rather than instructing them in how to accomplish those tasks. Mr. Thomas said that employers of all varieties could benefit by trusting and respecting their employees and cultivating a sense of openness, teamwork, and a shared sense of mission and vision in the workplace. View PowerPoint presentation on East Metro Health Careers Institute. View PowerPoint presentation on Skills Based Training Promotion (STEP) program. View PowerPoint presentation on: A Demand-Driven Catalyst for Workforce Development: Maryland’s Healthcare Coordinated Approach. View PowerPoint presentation: Recommendations for Building a Healthcare Career Pipeline in Baltimore. Momentum is growing behind efforts to build a skilled healthcare workforce in Baltimore, efforts that promise to help both low-wage workers and hospitals and other employers. That momentum was evident during a March 2, 2004, conference in Baltimore that brought together more than a hundred people with a stake in the issue – including representatives from hospitals, unions, advocacy groups, community colleges, foundations and community groups. Organized by the Job Opportunities Task Force (JOTF) and supported by grants from the Abell Foundation, the Annie E. Casey Foundation, Open Society Institute–Baltimore and the Association of Baltimore Area Grantmakers, the conference sought to examine key issues surrounding healthcare workforce development by looking at results of similar efforts taking place both outside Baltimore and within the city. An analysis of the Baltimore region’s economy has pinpointed healthcare as an industry sorely in need of workforce development. That group, known as the Baltimore Healthcare Coalition, has more than 60 members and has been meeting for almost a year to consider new approaches to attracting and training healthcare workers. Attendees at the conference heard from leaders of workforce programs in Philadelphia, Boston and St. Paul, Minnesota – reports that outlined program successes and sketched out challenges that the Baltimore effort can expect. Representatives of a Maryland state worker training program known as STEP also reported on the positive gains the program has produced, both for low-wage hospital workers and for their employers looking to find trained employees for hard-to-fill jobs. Participants in the conference also took part in small-group discussions of the strengths and weaknesses of various programs described during the day, assessments that will be used by the Healthcare Coalition as it continues its work. The conference was highlighted by reports from the directors of three workforce programs that focus on the healthcare field. Feldman noted that a key to the Fund’s success has been being able to schedule services, including classes, at times that are convenient to workers; it operates from 7:30 a.m. to 10 p.m., seven days a week. A second speaker, Mary Rosenthal, director of East Metro Health Careers Institute in St. Paul, also echoed the importance of a flexible schedule of services. Her organization is a collaborative effort of four St. Paul hospitals and two community colleges to build healthcare career ladders that will lead to stronger skills and better pay for low-wage workers. The Institute, which was launched in 2001, has placed 156 of its graduates in jobs, with an average increase in pay ranging from 20 percent to 55 percent, depending on the job category. Among the challenges facing the Institute is being able to accurately project which kinds of jobs will be vacant at the member hospitals. Securing funding has also been a problem, Rosenthal said, in part because some funders want quick “proof” that the program is working. The third speaker, Sarah Griffen, director of the Boston Healthcare and Training Institute, described that organization’s success providing training, education and support services for workers with 11 employers in healthcare and research. The Institute’s collaborative work is paying off for employers, she said. “They are seeing the benefit of the program and know this is a worthwhile effort,” Griffen said. She stressed the importance of establishing good communication with employers, and not just with their top-level executives. Support from mid-level supervisors at healthcare institutions is crucial as well, as they deal directly with employees and have to approve, for example, leave time for workers to take classes or attend training sessions. 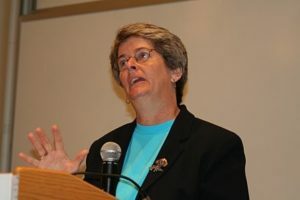 Like her counterparts in Philadelphia and St. Paul, Griffen noted the dire need for basic skills and education of many low-wage workers in the field. “Almost to a person, supervisors say their employees lack basic foundation skills,” Griffen said. While Baltimore does not yet have a large-scale, collaborative workforce development initiative for healthcare workers, some city employers and workers have benefited from the Skills-Based Training for Employment Promotion (or STEP) program. Under the program, local grant recipients team with employers in selected fields to provide training for certain job categories. The cost is shared: the state-funded STEP program pays for the actual training while the employer pays the wages of workers being trained. However, no funding was allocated for STEP in this year’s state budget. Jo-Ann Williams, human resources manager for the University of Maryland Medical System, said STEP has helped the hospital address pressing workforce needs. And giving low-wage workers an avenue for advancement to jobs with higher pay and better career opportunities has improved morale, she said. Projections show that the need to recruit and train healthcare workers in Baltimore and Maryland will continue to grow in coming years. Pamela Paulk, vice president for human resources at Johns Hopkins Health System, said that Maryland’s hospitals will create roughly 1,000 new openings a year in seven “hot” job categories that require an associate’s degree or less, including nurse extenders and surgical technicians. Catherine Crowley, vice president of the Maryland Hospital Association, said solving the staffing problems collectively will require new thinking on the part of employers. “For at least 15 years, the hospitals in Maryland have been committed to the concept of ‘grow your own’ employees,” Crowley said. Keynote speaker Robert Giloth saluted the conferees for exploring new approaches. Giloth, director of Family Economic Success at the Casey Foundation, has written extensively about workforce development, particularly the involvement of “workforce intermediaries,” a broad term describing various kinds of organizations and collaborations involved in job-training, recruitment and career-advancement activities. Researchers and policy-makers associated with a recent American Assembly dialogue on workforce intermediaries are studying such organizations, looking at how they work well – and why. Among the findings: such organizations should have multiple funding sources and should be collaborative efforts among various partner groups. The stakes are high, he added – for workers struggling to make ends meet in low-wage jobs, as well as employers and the larger society. Among the attendees was Robert W. Seurkamp, executive director of the Governor’s Workforce Investment Board for the state of Maryland. He applauded the diverse group for working collectively on a solution to a pressing workforce problem. “What’s most important is that people like this are coming together to deal with the workforce development issues that can’t be done by any one individual or one company or one group,” Seurkamp said. In particular, he said he was pleased that the discussion focused on assisting both workers and employers. At the same time, Seurkamp said the fiscally strapped state government will be hard pressed to provide additional funding to workforce development programs. At the same time, the federal government has established a new pool of resources for training in growth industries. Leaders of the healthcare workforce effort in Baltimore said they expect Baltimore and Maryland to attract additional federal funding to help solve their labor challenges. And they called on state leaders to examine ways of reallocating state funding to assist with the healthcare training effort. Speakers: Mary Ann Hewitt, Associate Executive Director, Maryland Council on Economic Education; Carol Jarvis, Ph.D., Executive Director, Maryland Council on Economic Education; Kevin Jordan, Associate Director, Bon Secours of Maryland Foundation; Althea Saunders-Ranniar, Working Families Initiative Program Director, Bon Secours of Maryland Foundation. Low-income workers who wish to move up and out of poverty need more than just a job; they also need to know how to make their earnings work for them and their families, said a panel of economic education experts at a JOTF/Open Society Institute-Baltimore forum on December 11. For Baltimore’s low-skill workers, the path to financial independence often involves more than acquiring new skills and finding better-paying jobs. Achieving economic self-sufficiency for themselves and their families requires a sound knowledge of the principles behind saving, investing, debt reduction, and asset development. These principles are complex and can be intimidating, especially for the large numbers of low-skill workers who never received formal financial management training. In response to this knowledge gap, public and private stakeholders in the Baltimore region are developing collaborative initiatives to provide financial literacy and other asset-building services to low-income families. 1. In 2001, Maryland ranked second in the nation in median household income, fifth in per capita personal income – and ninth in bankruptcy rates. 2. 10.6 percent of the 17,900 active clients of Consumer Credit Counseling Service of Maryland and Delaware, Inc. are between the ages of 18 and 26. People within that age range represent approximately the same percentage of the general population. 3. Fifty percent of high school graduates enter the workplace directly from high school, but only 15 percent of graduates received any instruction in personal finance. 4. Forty percent of Americans say they live beyond their means. Fifty percent of all Americans live from paycheck to paycheck. 5. Americans saved only 2.3 percent of their disposable incomes in 2001; during World War II, Americans saved 24 percent of their incomes. 6. Only 48 percent of Americans save for retirement; companies that provide pensions or manage retirement funds are becoming increasingly rare. Dr. Jarvis described the Maryland Coalition for Financial Literacy (MCFL), which grew out of a concern within the Maryland Council on Economic Education regarding the large numbers of Marylanders who are taken advantage of by unscrupulous lenders. Among MCFL’s goals is that every Maryland schoolchild will have taken a course in personal finance before he or she graduates from high school. Currently, only Baltimore County offers financial education in its high schools. Mary Ann Hewitt offered details about MCFL’s free programs, including the Stock Market Game, an international educational simulation that teaches adults and youth about stock markets and the U.S. and global economies. Another program, Financial Fitness for Life, is designed for low-income communities and offers fundamental lessons about credit, debt, and wealth. MCFL also provides training for service providers who wish to educate their clients about the basics of financial management. For more information about the Maryland Council on Economic Education and the Maryland Coalition for Financial Literacy, visit www.econed.org. Kevin Jordan listed some of the economic challenges facing residents of Southwest Baltimore, the site of Operation Reach Out SouthWest (OROSW) initiative. The average wage in Southwest Baltimore is $9.60 per hour, while the average starting wage for participants in OROSW’s Southwest Jobs program is $7.50 per hour. According to a 2001 report by Wider Opportunities for Women and others, the economic self-sufficiency level for a family of three in Baltimore is $17.75/hour. •People with debt problems are more likely to jump from job to job for only a slight increase in pay. Althea Saunders-Ranniar spoke of the ways Bon Secours of Maryland Foundation and others are working to address Southwest residents’ financial needs. Through Our Money Place, a newly opened financial services center in Southwest Baltimore’s Westside Shopping Center, residents receive information about credit/debt management, banking, savings, taxes, budgeting, financial planning, and predatory lending. For more information about Our Money Place, contact Kevin Jordan at 410-362-3016. Introductory Remarks: Robert L. Bogomolny, president, University of Baltimore; Patrice Cromwell, Program Development Fellow for Workforce and Economic Development, Open Society Institute – Baltimore; Joanne Nathans, president, Job Opportunities Task Force. Over 70 people joined JOTF in welcoming Secretaries Fielder and McCabe for a discussion about how the Ehrlich administration plans to move more low-income workers and job seekers to economic self-sufficiency. Two state agencies, the Department of Labor, Licensing, and Regulation (DLLR) and the Department of Human Resources (DHR), play a vital role in helping low-income workers and their families move up and out of poverty. DLLR assists job seekers in finding employment, provides unemployment insurance compensation, and offers training for workers to advance in their careers. DLLR also assists employers by administering incumbent worker training initiatives like the STEP Program, and by providing access to federal and state tax credits. DHR implements programs to promote family self-sufficiency through employment and work supports. In addition, businesses can work with DHR’s Office of Work Opportunities to recruit from targeted populations and obtain financial incentives for hiring. Secretary James Fielder remarked that despite the fact that Maryland’s lower unemployment rate is one-third below the national average, the State must do more to resolve its “underlying structural problems” where discouraged workers are concerned. He said that Governor Robert Ehrlich had charged DLLR with working to resolve these and other workforce challenges facing Maryland workers and job seekers. Unemployment Insurance – Maryland’s unemployment insurance trust fund has a required solvency level of $832 million dollars. At the end of September there is projected to be $657 million in the trust fund. This shortfall will result in a surcharge on employers, who will pay $85 to $87 per employee more each year beginning in January 2004. It is important to protect the solvency of this fund, so the fund is “healthy” and available when workers lose jobs through no fault of their own. Any effort to use unemployment insurance funds to increase worker benefits must be weighed against the potential fiscal impact of that use. DLLR Reorganization – DLLR is undergoing a reorganization process designed to increase efficiency and improve the agency’s services to low-income workers. Since January DLLR has experienced a 10 percent decrease in staff, while it increased its efficiency by 14 percent. The Governor’s Workforce Investment Board, (GWIB), formerly an independent State agency, is now part of DLLR under the chairmanship of Gino Gemignani, senior vice-president of the Whiting-Turner Contracting Company. GWIB hopes to become “more policy-driven,” and less of an “operating entity” than it has in the past. Low-income Workers – Secretary Fielder is working with Secretary McCabe, State Superintendent of Schools Nancy Grasmick, and Department of Business and Economic Development Secretary Aris Melissaratos on policy solutions to the employment needs of ex-prisoners who re-enter society. Under current State policy, for example, inmates are prohibited from accessing the internet, which precludes them from engaging in some methods of distance learning. Under Congressional proposals for the reauthorization of the federal Workforce Investment Act of 1998 (WIA), lower amounts of federal workforce funding will be available for worker training and program administration. Federal Wagner-Peyser funding to Maryland faces similar cuts. At the State level, funding for the two-year-old Skills-based Training for Employment Promotion (STEP) program was cut from $1 million to $500,000 this year. A new initiative, Maryland Business Works, will apply $1 million of a federal incentive grant toward incumbent worker training. This program will provide a dollar-for-dollar match for training to businesses with 50 employees or less that are located in the State’s WIA regions. The program will not be targeted to low income workers. Secretary Christopher McCabe described Maryland’s welfare reform strategy, saying that the goal of DHR was for public assistance recipients to “independently support themselves.” Workforce development is an essential part of achieving this goal, and requires flexibility at the local level and partnerships with nonprofit organizations. DHR manages the Family Investment Administration (FIA), which was established in 1995 to assist Temporary Cash Assistance (TCA) recipients in finding work and other services at local Department of Social Services (DSS) offices. Under FIA guidelines, each local DSS office was instructed to develop family investment plans for public assistance recipients to move to self-sufficiency. Consequently, each local DSS branch implements a different strategy to best serve families within its region. Kevin Maguire is the new executive director of FIA. Families have both rights and responsibilities in the public assistance process. For example, they have the right to receive fair and equal treatment and to receive responses within 30 days of applying for assistance. Recipient responsibilities include pursuing child support, seeking employment and/or participating in allowable work activities, and achieving self-sufficiency prior to the five-year time limit on public assistance. DHR hopes to achieve a “one-stop shopping” system in which recipients can access Food Stamps, TCA, medical assistance, and other types of assistance at one location with a minimum of bureaucratic barriers. Secretary McCabe cited the “tremendous success” of the federal Temporary Assistance for Needy Families (TANF, commonly known as welfare reform) program in reducing welfare caseloads and moving recipients into employment. Still, a “change of culture” in the administration of public assistance is required to address recipients’ barriers to employment. Regarding childcare, Secretary McCabe said that “there is no evidence” to indicate that parents are dropping out of the workforce because they are unable to find adequate care for their children. He attributed the long waiting list that currently exists for childcare services to the $21 million deficit in the Purchase of Care Program. Speakers: Patrick Cassidy, Deputy Director, Governors Workforce Investment Board; Raymond Eibel, Business Development Manager, Educational Data Systems, Inc.; Michael Gaines, President & CEO, Maryland Center for Arts & Technology. View Raymond Eibel’s PowerPoint presentation on Tiered Employment. Job placement is just the beginning of a process that can lead to self-sufficiency for low-income employees and reduced turnover costs for employers. Most public workforce funding does not cover post-placement strategies that promote career advancement and increase retention. Yet opportunities exist for philanthropic foundations to work with nonprofit service providers, public agencies, training institutions, and businesses to provide resources and align performance measures to ensure positive long-term results for workers and employers. A panel of workforce development experts discussed strategies for partnering with employers to move Baltimore’s low-skill workers up the career ladder at a forum sponsored by the Job Opportunities Task Force (JOTF) and Open Society Institute-Baltimore on Thursday, June 12 at the University of Baltimore’s Merrick School of Business. Patrick Cassidy began by providing information on Maryland’s current workforce landscape. From 1990 to 2000, the State experienced a 16 percent decrease in the number of residents with less than a high school diploma and 55 percent of high school graduates attend college, indicating that education levels of rising. At the same time, however, the number of individuals in poverty increased by 14 percent during the same period. In terms of workforce demand, Maryland’s services, construction, and retail sectors are the areas with the most projected job growth. The top five fastest growing occupations, or 48 percent of the projected annual openings, are in office and administrative support, sales, food preparation and service, management positions, transportation, and materials handling. While 28 percent of these openings require a Bachelors degree, 63 percent only require on-the-job training. Thus there is an opportunity for service providers to meet employer needs and help them with their bottom line. Mr. Cassidy went on to speak of the need for a demand-driven workforce development system in which “placement is only the beginning,” and where service providers work closely with employers and training institutions to create supportive work environments so that incumbent workers can advance in their careers. In order to achieve this, employers need workforce services from committed intermediaries that view business as the customer. He said that nonprofits are well placed to serve in this capacity, because of their competence in working with “hard to serve” populations, and because they are able to collaborate with each other in ways that are unavailable to for-profit companies. Raymond Eibel described the ‘tiered employment’ model used by Educational Data Systems, Inc. (EDSI) in Philadelphia, where EDSI holds the city’s Welfare-to-Work contract. Tiered employment is an employer-driven strategy that uses skills training and assessment tools to help job seekers and incumbent workers move up the career ladder. The model connects participants with intensive job readiness and occupational skills training during a transitional period of employment in a low-skill, entry-level position. At the end of that period, provided they performed satisfactorily in the first-tier position, participants move to a higher-skill, higher paying position with another company, possibly within a different sector, that offers more career growth and earning potential. When tier one employees are ready to advance to the second tier, their employers complete an occupational skills survey that describes the skills the employees have acquired during their tenure in the first tier. EDSI uses an automated, web-based system to connect program participants to employers. Job developers and employment representatives facilitate the match. Employers are able to post jobs online and view information on available candidates and their status, while employees can perform customized searches for the jobs that are most appropriate for them. This system facilitates individual career development by providing employees with resources and information based upon their individual career goals. Their career goals, skills, work history, and profile are all entered and tracked in the database. Increased retention is critical to employers. Employees who remain for a period of six months to one year in tier one provide an increased retention rate for those employers. Employer participation is crucial to the success of a tiered employment program. As a result of this approach, job seekers, many of whom have little or no experience with career counseling or goal-setting, are motivated to stop making lateral moves from job to job with no hope of advancement. Mr. Eibel emphasized that these job seekers constitute a viable workforce and should not be regarded as merely a “hard to serve” population. The challenge, he said, is helping these individuals develop their skills, goals, and work habits in order to meet employers’ needs and their own. Mr. Gaines said that career advancement strategies for low-skill workers are necessary for several reasons. At the most basic level, models such as customized training and tiered employment provide workers with the opportunity for personal and career growth by helping them build on past skills and experiences. As they advance in the workforce, they are better able to economically sustain themselves and their families. This in turn has a positive influence on communities and regions, because financially stable families are more likely to purchase homes and contribute to their local economy, and their children are more likely to remain in school. In order to effect these positive changes, nonprofit workforce development and training providers must become more knowledgeable about the regional economy and the industries with which they work. Customized training is an employer-driven process whose end result is workers that are adequately trained and ready to stay on the job. Mr. Gaines said that “consolidation of the provider network” may be necessary to respond to changes in the economy. Using this market approach, service providers will either increase their performance and outcomes, or risk losing market shares to those that do. At the same time, he added, employers should bear some of the costs of receiving the products [i.e. trained workers] that providers offer them. It is important for businesses to invest in the training of their employees. Speakers: Andy Van Kleunen, executive director, Workforce Alliance; Lynda Meade, director of social concerns and parish social ministry, Catholic Charities; Sylvester McKay, Ph.D., president, Baltimore City Community College; Christopher Thompson, Ph.D., Senior Research Associate, Johns Hopkins University Institute for Policy Studies. View Andy Van Kleunen’s PowerPoint presentation on Current Federal Reauthorization Proposals. View Christopher Thompson’s PowerPoint presentation on Workforce Investment Act Reauthorization. Over 60 people attended an April 23 forum on major legislation pending on Capitol Hill and the significant implications the measures hold for low-wage workers in Baltimore. 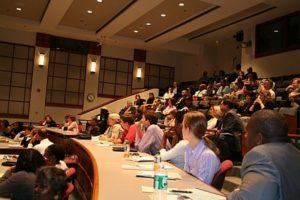 The forum was held at the University of Baltimore’s Merrick School of Business and co-sponsored by the Job Opportunities Task Force, Open Society Institute-Baltimore, and the Jacob France Institute. The three pieces of legislation scheduled for reauthorization this year are the Workforce Investment Act (WIA), the Higher Education Act (HEA), and Temporary Assistance for Needy Families (TANF) – which together include funding for such key programs as college scholarships, job training, and financial support for single parents. “All three of these federal funding streams are critical to developing the skills and raising the income opportunities for low-wage workers,” says Deborah Povich, executive director of the Job Opportunities Task Force. Andy Van Kleunen provided an overview of recent developments in Congress regarding WIA, TANF, and HEA. WIA: The Workforce Investment Act is designed “to consolidate, coordinate, and improve employment, training, literacy, and vocational rehabilitation programs in the United States.” A Senate vote on WIA reauthorization is expected in May, while floor vote on the House’s WIA bill, H.R. 1261, has been delayed. Among the elements of H.R. 1261 are a consolidation of Adult, Dislocated Worker, and Employment Service funding into a new $3.1 billion “Comprehensive Adult” block grant; transfers greater authority from local workforce investment boards to state governors, and contains no provision for personal re-employment accounts (PRA’s). According to Baltimore City officials, WIA has helped about 300 Baltimoreans improve their job skills through the use of Individual Training Accounts in the last nine months. In that time, more than 10,000 people have received help with job searches, referrals, skills assessments and literacy training. TANF: Commonly known as welfare reform, the Temporary Assistance for Needy Families program was part of the Personal Responsibility and Work Opportunity Reconciliation Act of 1996. TANF was designed to reduce states’ welfare rolls and designed to focus on work and responsibility and “to provide states with flexibility to create the best approaches for their individual circumstances.” In February 2003 the House passed H.R. 4, a TANF reauthorization bill. This legislation calls for further limits on allowable work activities; raises required work hours to 40 per week; raises work participation rates to 70 percent; and allows no more than four months for education and training. The Senate Finance Committee is expected to vote on TANF this summer. Current TANF law has been extended through June 2003. HEA: Reauthorization of the Higher Education Act and the Carl D. Perkins Vocational and Technical Education Act is expected in late 2003 or early 2004. Current guidelines for this legislation favor full-time college students who are pursuing academic degrees, while part-time students and those who wish to enhance their skills without pursuing degrees experience difficulty in accessing funding under these acts. The Workforce Alliance calls for expanded eligibility guidelines that would do more to support education and training of working adults. Lynda Meade said that TANF reauthorization will have implications for both parents and state agencies that oversee welfare programs. “The new requirements will probably translate into moms putting in more hours into programs and a job, and will put pressure on the state to achieve higher rates of participation in those programs,” she said. “The folks who have left welfare for work more recently have had a harder time meeting their job requirements. They have more issues to deal with, including child care, transportation, and a poor economy.” Ms. Meade noted that under current economic conditions, the State does not have additional resources to provide these vital work supports. Christopher Thompson rated various aspects of WIA-funded workforce programs. He gave high marks to the One-Stop systems for their customer focus and their ability to deliver multiple services at integrated points. He also praised the Local Workforce Investment Board (LWIB) and Governor’s Workforce Investment Boards (GWIB) networks for encouraging employer participation and for taking the initiative in establishing governance structures. Other elements of the system received lower grades. Dr. Thompson pointed out gaps in system-wide performance measures and data collection, a paucity of Individual Training Account (ITA) funding, and lack of full employer engagement. He suggested ten ways of improving on WIA, including: expansion of demand-driven features; adoption of flexible funding; investment in technology to support decisions; and movement to benchmarking and performance support. Dr. Thompson’s grades and suggestions for improvement can be viewed by clicking the link to the Power Point presentation, above. Sylvester McKay stressed the importance of public investment in education as a key to developing a skilled workforce. Community colleges play an important role in this process because of their emphasis on vocational training and career development. Most rating systems are based on the number of students graduating. But many people improve their work opportunities by taking a few courses, which may not result in graduation, but which can still be considered a successful outcome. Measuring a community college’s performance by the same academic standard used to evaluate four-year institutions does not accurately reflect the value of targeted skills enhancement that community colleges provide, upgrades which are critically important to low-wage workers and job seekers. Two local union leaders urged Baltimore area policy makers and employers to ensure that low-skill workers have adequate wages, benefits, and opportunities for advancement. This is particularly important, they said, in the case of new businesses that are attracted to Baltimore City, often with public tax incentives. “Baltimore is not getting the full benefit of its investment because the jobs being created are not lifting the city out of poverty,” said Roxie Herbekian, a 20-year veteran labor organizer who has organized thousands of hotel, food service and parking workers and is working to revitalize Baltimore’s hotel employees local. Ms. Herbekian used examples from the development of Camden Yards and area hotels to show the need for a more comprehensive approach to economic development that does more than just subsidize businesses to encourage them to expand or move into the region. Fred Mason, President of the Maryland and D.C. State Federation of Labor, about the need for additional education and training opportunities to help low-income workers get and keep family-sustaining jobs. A former auto worker and steelworker, Mr. Mason focused his comments on the employment needs of Maryland’s ex-prisoner population. Approximately 15,000 inmates are released annually from the state’s correctional institutions. Two-thirds of these inmates don’t have a high school diploma and are trying to support at least two children. Although the strong economy of the 1990s lifted the economic fortunes of working families for the first time in decades, the current recession has lead to a dramatic increase in unemployment, and job growth is stagnant at best. These findings are part of The State of Working America 2002-2003, a report by the Economic Policy Institute, a Washington, D.C.-based nonprofit think tank. Released biennially, The State of Working America examines the impact of national economic trends on the lives of working families. Report co-author Heather Boushey, an economist with EPI, presented the findings of the report at a forum co-hosted by the JOTF and Open Society Institute – Baltimore. Dr. Boushey said that one lasting legacy of the 1990s appears to be strong productivity growth, which has meant that wages—although growing slowly—are still outpacing inflation. While this is some comfort for those who remain employed, she warned that a jobless recovery will lead to wage stagnation, higher poverty rates, and rising inequality. The labor market recession, which began in October 2000 remains with us. This recession marks the end of the long economic boom of the 1990s, which brought the first, broad-based increase in wages and incomes in decades. Low-wage workers especially benefited, as poverty rates dipped to historic lows. The 1990s also brought, however, substantial increases in household debt. The long-term trend towards increased hours of work continues and having a “working mom” remains a salient fact of American family life. University of Baltimore economist Richard Clinch provided a local perspective on the report’s findings. He said that it is important for Baltimore City to ensure that workers are trained for jobs in growing industries such as biotechnology. “If you don’t create the programs to train the workers for the companies that are coming, the workers will just come from the suburbs,” he said. He emphasized, however, that Baltimore has seen improvements in the placement of low-skill workers. For example, the city’s job gap has decreased from 2.9 candidates for every low-skill job in 1997 to 1.8 candidates in 2000. Mr. Clinch recommended that the City capitalize on these improvements by increasing opportunities for worker education and training, and by expanding the region’s mass transit system so that workers will be able to access jobs in the suburbs. Panelists: Ioanna Morfessis, President & CEO, Greater Baltimore Alliance; Michele Whelley, President, Downtown Partnership; Jeremy Nowak, CEO, The Reinvestment Fund, Philadelphia. Ioanna Morfessis described the mission and purpose of the Greater Baltimore Alliance (GBA). GBA is a regional economic development corporation that works to promote the Greater Baltimore area as a premiere business location. Ms. Morfessis provided a broad context for GBA’s economic development strategies. Local, national, and international economies are in a phase of weakness and slow development, she said. Even though the U.S. economy is technically no longer in recession, American firms report only nominal growth. Because other countries have aggressive, well-funded economic development initiatives designed to attract U.S. businesses overseas, regional competition within the United States has become increasingly fierce. Baltimore’s regional economy has fared better than others due to its success in retaining information technology firms and companies with defense and homeland security contracts. In addition to recruiting new firms to the Baltimore region, Ms. Morfessis stressed the importance of retaining companies that are already located here. One of the keys to this retention, she said, is a qualified workforce. Due to the tight economy, businesses are increasingly unwilling to work with harder-to-serve populations. At the same time, she predicted, businesses will be called upon to demonstrate an increased commitment to the communities where they are based. Calling people the Baltimore area’s “most valuable asset”, Ms. Morfessis said that institutions concerned with the region’s health must develop ways to offer economic opportunities and help young people realize their aspirations. GBA has encouraged the local philanthropic community to focus on methods of keeping young people from leaving. Young Baltimore residents, she said, are a key to success. She mentioned that in Philadelphia, new market growth in real estate is driven not by homeowners, but by high-end renters. In the question and answer period that followed, Ms. Morfessis spoke about the disconnection between the business sector and public economic development strategies, saying that no political will currently exists at the city or state levels to make the region competitive. Regarding factors that attract companies to an area, she said that some business leaders make their decisions based on a jurisdiction’s tax structure. 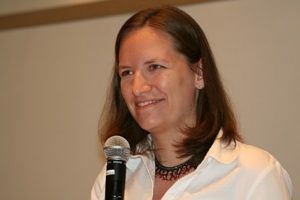 Michele Whelley described downtown Baltimore as encompassing the area from Mount Royal Avenue to the Inner Harbor, and from Martin Luther King Boulevard to President Street and Fells Point. Downtown Partnership (DP) manages and administers the Downtown Management District, a 106-block business improvement district defined by city law. DP employs approximately 70 men and women who perform public safety and maintenance duties in this area. DP develops partnerships with local government and the private sector to identify needs and develop strategies designed to strengthen the area’s economic vitality. Recently, DP worked with city government and local businesses to establish the Baltimore Parking Authority in response to companies’ concerns about the lack of available parking space downtown. Another DP-led revitalization effort involves the conversion of vacant class C commercial buildings into residential space. One of DP’s newest initiatives is the creation of DASH, a shuttle service that provides transportation between parking lots and points throughout the downtown area. Ms. Whelley said that DASH was created as an interim solution to the parking problem while development of new parking space is underway. Currently, DP is examining the issue of homelessness in the downtown area. Ms. Whelley said that one idea under consideration is the combination of outreach and services for homeless individuals with civility regulations that would reduce panhandling. She cited Philadelphia’s Comprehensive Sidewalk Law, which has been effective in reducing the visibility of the homeless population in Center City Philadelphia. Ms. Whelley echoed Ms. Morfessis’ call for a more talented workforce. Baltimore has the potential to be a leader in creating jobs in the information technology and bioscience fields, she said. But in order to accomplish this Baltimore must be successful in retaining and attracting businesses and in providing a skilled workforce. In the question and answer period that followed, Ms. Whelley emphasized that quality of life is an important factor in a business’ decision to remain in or relocate to an area. We must have a cleaner downtown, she said, and we must acknowledge that there are some things we cannot change. Regarding transportation connections between city residents and suburban jobs, she said that a task force appointed by Governor Glendenning is considering the adoption of a mass transit system based on that of Washington, D.C. However, such a system would take approximately 40 years to fully implement. Jeremy Nowak said that The Reinvestment Fund (TRF) works in Philadelphia “at the intersection between economic growth and social capital betterment.” According to its mission statement, TRF is “a development finance corporation with a wealth-building agenda for low- and moderate-income people and places through the strategic use of capital, information and market systems/innovation.” TRF provides financial support for affordable housing, community service organizations, small businesses, workforce development programs and energy conservation projects. Focusing on social equity issues by developing the most appropriate methods for states to be redistribution agents. The fact that the locations of state and local governments frequently do not correspond to the locations of industry sectors and labor markets. In addition, Mr. Nowak said that urban development and revitalization agendas must be long-term, but many cities have lost the capacity to engage in this type of planning. TRN is pro-growth, he said. Individuals engaged in social service work tend to be in favor of redistribution, but since growth is a necessary condition for this redistribution, cities must be competitive. Regarding the last item, Mr. Nowak said that investments can be coupled with workforce services as a method of discovering and closing the gaps in the workforce development system. Mr. Nowak stressed the importance of institutions that can serve as intermediaries to stimulate reinvestment and facilitate partnerships between local governments and the private sector. Effective intermediaries, he said, possess some combination of the following characteristics: regional scope; availability of funding; useful products, such as information or marketing capability; the capacity to speak for the region. Panelists: Martin Ford, Ph.D., Assistant Director, Maryland Office for New Americans; Gustavo Torres, Executive Director, CASA of Maryland; Samedy Sok, Director, Tressler Refugee and Immigration Services. Martin Ford described several widely held myths concerning immigration and immigrants: that immigration in the United States is “out of control”; that immigrants take jobs from native-born workers; and that a disproportionate number of immigrants live on public assistance. Dr. Ford cited data from the 2000 U.S. Census, which show that approximately 31 million foreign-born individuals reside in the United States. While a record in raw numbers of immigrants, this figure represents only about 10 percent of the U.S. population. A similar ratio exists in Maryland, where approximately half a million immigrants comprise roughly ten percent of Marylanders. Between 1880 and 1924, Baltimore was America’s third largest port of entry, with nearly 1.5 million immigrants arriving at Locust Point. Since then, the numbers of immigrants arriving in Baltimore have declined sharply. Today, Baltimore City trails Montgomery, Prince George’s, and Baltimore Counties in new immigrant residents. Dr. Ford said that this shift is part of a larger national trend of immigrants gravitating toward rural and suburban areas. Regarding the issue of job displacement, Dr. Ford remarked that many immigrants find work in industries with unfavorable working conditions and low wages, in jobs that many native-born Americans find undesirable. He said that the steady influx of immigrant labor into such sectors as hospitality and agriculture acts as a disincentive to employers to improve working conditions or raise wages. Some employers, he said, fear that if they improve working conditions, jobs in their industries will move overseas. He added that immigrants in fact create jobs by working in these sectors, as demonstrated by the fact that the ten U.S. cities with the largest immigrant populations are also the cities with the lowest unemployment rates. Dr. Ford said that many Americans believe that a high percentage of immigrants rely on public assistance. However, according to the U.S. Department of Health and Human Services, only 22 percent of newly arrived immigrant families receive public benefits. The majority of immigrants are low-wage workers who fall into the category of “working poor”, meaning that their incomes fall substantially below the federal poverty line. Compared to non-immigrant families, the numbers of immigrants who are eligible to receive public benefits are far greater than the numbers who apply. The immigrant economy is an “hourglass economy”, he said. Twenty-five percent of American doctors are foreign-born, as are 25 percent of Silicon Valley information technology professionals. At the same time, immigrants comprise a large proportion of the low-skill and unskilled working population. By depressing wages in industries that employ low-skill workers, data show that immigrant labor enhances the financial well-being of employers and higher-skilled professionals, and acts as a “safety valve” against inflation. Baltimore should do more to attract immigrants, said Dr. Ford. He mentioned Boston, Miami, and New York as examples of cities whose economies improved markedly as a result of immigration. The key to attracting immigrants, he said, is improved educational and employment opportunities for foreign-born workers and their families. Gustavo Torres described the work of CASA of Maryland. Based in Rockville, CASA works to improve the economic and social welfare of the state’s Latino communities through programs in the areas of employment, education, housing, health, and legal services. CASA was founded in 1985 to respond to the human service needs of Central Americans arriving to the area after fleeing wars and civil strife in their countries of origin. In the 1990s, CASA began community organizing and advocacy efforts on behalf of the Washington region’s day laborers and domestic workers, most of whom are Latinos. A resource center was established in 1992 to provide legal assistance to day laborers who had not received wages promised them by employers. In addition to legal services, the center offers classes in English for Speakers of Other Languages (ESOL), intake and assessment of eligibility for services, and information about immigration procedures. Among the public policy issues on CASA’s advocacy agenda is support for a living wage ordinance in Montgomery County, which was enacted. In collaboration with the AFL-CIO, CASA is currently working to establish a national Day Laborer’s Union. With support from the Open Society Institute, CASA recently opened a branch in Baltimore to provide legal advocacy for day laborers in the Baltimore region. Samedy Sok is director of Tressler Refugee and Immigration Services of Maryland, an affiliate of Lutheran Immigration and Refugee Service. Located in southeast Baltimore, Tressler provides comprehensive resettlement services, including employment, to between 15 and 25 refugees each month. Mr. Sok spoke of his personal experience as a refugee from Cambodia. He came to the United States in 1982 after spending three years in a Thai refugee camp. 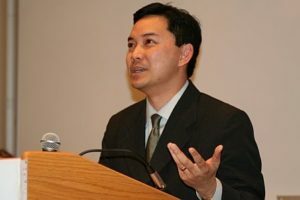 He described the suffering inflicted upon government officials, intellectuals, and members of his own family during Cambodia’s civil war, which ended in 1979. Fleeing persecution by the Khmer Rouge, he sought refuge in Thailand before applying for asylum in the United States. Panelists: Marion Pines, director of the Sar Levitan Center at Johns Hopkins University; Jaquelene Massey, program manager of the Baltimore City Career Academy; Gary Unfried, principal of Harbor City High School. Each year, approximately one in 10 Baltimore City high school students withdraws from school before graduation or before completing a Maryland-approved educational program. Lacking the skills and education needed for jobs that pay a decent wage, these young people often are unable to become economically self-sufficient. Compared to high school graduates and adults with post-secondary education, dropouts and disconnected youth face a higher probability of becoming substance abusers or single parents, and are more likely to fall under the jurisdiction of the criminal justice system as inmates or ex-offenders. The phrase “disconnected youth” refers to young people who are both out of school and out of work. Marion Pines provided an overview of issues facing dropouts and disconnected youth in the Baltimore region. Referring to an August 2001 study prepared by the Sar Levitan Center and Northeastern University’s Center for Labor Market Studies, Ms. Pines said in 1999 – 2000, approximately 13% of Maryland youth between the ages of 16 and 24 were both out of school and out of work. The largest concentration of such youth was in the Baltimore metropolitan area, with nearly 36,000 young people falling into this category. The percentage of disconnected African-American and Latino youth was much higher than that of disconnected white youth during the same period. These figures are significant because disconnected youth are much more likely to become involved in anti-social behaviors than their peers who are either in school or working. In 1998, for example, 75% of individuals processed by the Maryland Division of Correction reported themselves as high school dropouts. Additionally, the U.S. Census predicts that Maryland, and the Baltimore region in particular, will see a substantial growth in the populations of African-American and Latino youth over the next decade. Ms. Pines said that policymakers, employers, schools, and workforce and youth development programs should develop strategies to minimize the number and the regional economic impact of disconnected youth. Jaquelene Massey described the work of the Baltimore City Career Academy (BCCA). An alternative education center directly administered by the Baltimore City Mayor’s Office of Employment Development and the Baltimore City Workforce Investment Board, BCCA provides high school dropouts ages 16-21 with Graduate Equivalency Degree (GED) preparation and employment readiness training. BCCA is a nationally recognized member of the Promising and Effective Practices Network (PEPNET) and is the only non-residential Job Corps site in Maryland. Each year, BCCA serves between 125 and 175 dropouts from Baltimore City neighborhoods. Approximately 80 percent of students complete their GED training, obtain vocational internships, or make the transition to two- or four-year academic institutions. For the period July 1999 – April 2000, 50 percent of students who were enrolled at BCCA received a GED; 26 percent entered college; and 50 percent obtained paid employment. In addition to its academic programs, the school offers vocational training designed to prepare students for careers in the fields of business technology, health services, landscaping, human services, and information technology. Gary Unfried described the work of Harbor City High School (HCHS). The only alternative public high school in the U.S. with an honors program, HCHS has graduated more than 4,200 students since it opened in 1976. Located in west Baltimore City, the school serves students from throughout the region, and is funded by the Baltimore City Public School System, Empower Baltimore Management Corporation, and the Mayor’s Office of Employment Development. HCHS follows a trimester schedule, providing opportunities for students to enroll beginning in September, December, and March of each year. The school’s programs, including its GED Achievement program and its Junior Reserve Officer Training Corps (JROTC) program, are designed to build students’ self-esteem and self-motivation while helping them fulfill their high school graduation requirements. HCHS seeks to enhance the employability of its students by offering them coursework in business communications, technical education, and a variety of computer applications. Students are also involved in certain administrative decision-making activities, such as the selection of volunteer instructors. He explained that most refugees have undergone experiences similar to his. Displaced from their home countries as a result of war, persecution, and political turmoil, political refugees seek safety in other lands. If they are unable to return home due to continued upheaval, they must seek entry to a country that will grant them asylum and permit them to stay. Only a small percentage of displaced persons are admitted to the U.S. refugee program, which grants legal permanent resident status to approximately 70,000 asylum seekers per year. When they arrive in this country, refugees are urged to find permanent employment and strive toward family self-sufficiency in a very short amount of time. Resettlement organizations such as Tressler provide limited core services such as transitional housing and cash assistance, but have limited time and resources to assist their refugee clients. Mr. Sok called for greater public awareness of refugee issues in Baltimore and the U.S. He urged community members to reach out to the area’s growing refugee population. Panelists: Congressman Benjamin L. Cardin, U.S. House of Representatives; Hon. Samuel Rosenberg, MD House of Delegates; Deepak Bhargava, Director, National Campaign for Jobs & Income Support. In 1996, President Clinton signed the Personal Responsibility and Work Opportunity Reconciliation Act (PRWORA), known popularly as welfare reform. Now, six years later, debate on the reauthorization of welfare reform legislation is expected to begin immediately after Congress convenes in January 2002. Funding to continue Temporary Assistance for Needy Families (TANF) must be enacted no later than October 1, 2002. Throughout the United States, discussion is occurring on how to reshape and improve this legislation. Congressman Cardin provided an overview of the welfare reform debate in the U.S. Congress. Since 1996 child poverty has decreased nationwide and there are fewer people receiving cash assistance. These figures, however, are due to a multiplicity of factors, most notably the economic boom of the late 1990s. The impact of the current economic recession on states’ welfare rolls remains to be seen. Other indicators suggest that welfare reform was not as successful as it was intended to be. For example, while PRWORA reduced welfare caseloads, the number of people who have left welfare since 1996 remains higher than the number of former welfare recipients who are employed. Even among the employed, poverty has not been substantially reduced. Additionally, programs such as the Earned Income Credit, which is designed to assist low-income families, are in jeopardy because of current economic and political circumstances. Due to a number of factors, including the passage in 2001 of a $2 trillion tax cut, funding has been reduced for both the Safe & Stable Families Act and the $2 billion TANF contingency fund for states experiencing economic downturns. Spending levels for tax cut initiatives and the military, however, remain unchanged. In order for welfare reform to be successful, the federal government must continue and augment funding to states. TANF must primarily be a tool to help individuals out of poverty. Congressman Cardin proposes dedicating more funding for childcare, restoring benefits to legal immigrants, promoting two – parent families through elimination of the “illegitimacy fund,” and developing improved methods of tracking the progress of welfare leavers as they transition into the workforce. Additionally, states should make TANF funds and services accessible to non-working poor populations and implement more effective conciliation procedures so that individuals’ due process is ensured. · Increase to 39 weeks the amount of time claimants can receive unemployment compensation. Delegate Rosenberg encouraged attendees to make the case to the Maryland General Assembly for programs they consider important, even if they have a fiscal impact during this period of budgetary constraint. Otherwise, he said, they will not receive the attention they merit. While the General Assembly is awaiting action by Congress regarding reauthorization, it hopes to influence the debate in a constructive manner. Delegate Rosenberg said the focus of the General Assembly will remain consistent with objectives and policies of the past five years, but that the legislature will place emphasis on poverty reduction and skills training. In January 2002, Delegate Rosenberg and other legislators will introduce the Welfare Innovation Act of 2002. This legislation proposes that TANF funds in the state’s dedicated purpose account can only be used to support existing federal TANF laws and poverty reduction strategies. Mr. Bhargava said a third of the public assistance recipients who have left welfare since 1996 have not found employment. Among those who have entered the workforce, there is a high turnover rate. Most of the jobs these individuals find are low-wage and offer few benefits. Concerning public programs designed to help low-income families, only 40% of people without jobs are able to access unemployment insurance and only 60% of eligible families receive Food Stamps. Provide publicly subsidized employment opportunities, especially, in areas of high unemployment. Secretary Simms introduced the panelists and provided an overview of the Maryland Department of Public Safety and Correctional Services (MDPSCS). A major focus of MDPSCS is the transition of offenders into the community following incarceration. Due to inadequate funding for educational, vocational and social work programs within Maryland’s correctional facilities, inmates return to the community without the skills necessary to lead stable, productive lives in the community. Secretary Simms encouraged forum attendees to support initiatives that reduce recidivism, and to advocate for additional funding for existing programs. As of July 2001, 23,886 inmates were in DOC custody. Of these, 22,620 were men and 1,246 were women. Over half of these individuals are incarcerated in medium-security facilities, most of them for drug offenses. Approximately 37% of inmates were between the ages of 31 and 40. In FY 2001, 15,124 inmates were released from DOC institutions. Approximately 8,000 returned to neighborhoods in Baltimore City. In FY 01, Over 45% of inmates who had been released within the previous three years were re-arrested for new offenses. Deputy Commissioner Kavanagh emphasized the importance of strategies that reduce recidivism. The high recidivism rate in Maryland is responsible for high costs to communities, and it contributes to the severe overcrowding problem in Maryland’s correctional facilities. As of June 1, 2001, there were 70,113 active cases under MDPP supervision statewide. 22,149 individuals with active cases reside in Baltimore City. As of October 2000, MDPP agents handled a mixed caseload of high- and low-risk offenders, averaging 103 cases per agent. While programs like Break the Cycle and Correctional Options are effective in reducing recidivism and connecting ex-offenders to services such as substance abuse treatment, these initiatives represent only “scattered pockets of strength”, and are not currently part of a systemic, community-based correctional strategy. Help offenders become responsible and productive members of society. PCS accomplishes these goals by reducing MDDP agent caseloads and increasing agents’ involvement in the re-integration of parolees and probationers into the community. This allows agents to supervise ex-offenders more closely and to engage the community supports (family, friends, clergy, businesses, job development providers, substance abuse treatment providers, etc.) that can facilitate offender re-entry. Another key element of PCS is the implementation of an electronic case management system that will enable agents to more effectively store, retrieve and generate report on a wide variety of information for each offender under supervision. The Impact of Substance Abuse on Baltimore’s Workforce: What is Being Done About It? Jane Harrison introduced the panel and offered the following background information. There are currently over 500,000 Maryland residents who have no health insurance. Most live in the Baltimore metropolitan region, and many are addicted to illicit drugs. Baltimore City has only 7,600 substance abuse treatment slots available to serve this population, which includes a high number of women attempting to enter the workforce. Persons with substance abuse issues who attempt to enter the workforce frequently experience difficulty in finding jobs that can sustain families. Gale Saler said that in preparing persons with substance abuse issues to enter the workforce, it is important to show them that they have the ability to complete assigned tasks and work as part of a team. The long-term residential treatment model offers providers the opportunity to build in greater workforce development and other rehabilitative services. Ms. Saler said that few opportunities for long-term care exist in Baltimore, particularly for young people. The Center for Fathers, Families & Workforce Development (CFWD) began in 1993 as an initiative of the Baltimore City Health Department. It serves low-income, non-custodial fathers, of whom 75% face substance abuse issues. Joe Jones described the rigorous three-week employment readiness program which clients undergo. CFWD staff provides follow-up services for two years after graduation from the program. 25% of CFWD staff members are former low-income job seekers, Mr. Jones said. LSG/SkyChefs is the principal food services provider for airlines at BWI Airport. Randall Lucas said that although for safety reasons employees must be drug free, SkyChefs offers an Employee Assistance Program (EAP) through which employees may receive substance abuse counseling. If an employee fails a random drug test and admits to abusing drugs, he or she is referred to the EAP, which is confidential. Employees can also access the EAP for counseling on financial management and family issues. Randall Lucas described the financial impact of substance abuse on companies like SkyChefs, which pays for drug screening for new employees. At least one out of five new hires fails the pre-employment drug test, Mr. Lucas said. Glenwood Life provides managed care services to substance abusers and persons with HIV. Frank Satterfield said that one out of five patients who comes for treatment at Glenwood Life tests positive for HIV. Mr. Satterfield said that addicts face significant barriers to securing and retaining employment. Most substance abusers, for example, lack desirable job skills. And individuals participating in a methadone maintenance program are frequently denied employment because they fail pre-employment drug screens. Addicts who are employed, Mr. Satterfield said, fare better in treatment and face a substantially lower risk of relapse than unemployed substance abusers. Established in 1994 to administer the $100 million Empowerment Zone block grant awarded to Baltimore by the Federal government, EBMC is governed by a 30-member Board of Directors. EBMC will dissolve in 16 months, having completed its designated operating period. Baltimore’s Empowerment Zone is comprised of three non-contiguous areas in East, West and South Baltimore. Operating within those areas are 6 village centers located in the East Harbor, Harlem Park/Lafayette Square, Poppleton, Washington Village/Pigtown and Fairfield neighborhoods, as well as in neighborhoods represented by the Historic East Baltimore Community Action Coalition (HEBCAC). As of April 2001, 4,152 jobs have been created in the Empowerment Zone through expansion and start-ups. As of April 2001, 5,197 Zone residents have been placed in jobs throughout the Baltimore area. Investment Fund have been established to stimulate business development. Six community-based career centers provide access to employment services in locations that are within easy access of Zone residents. The Mayor’s Office of Employment Development (OED) is a major partner in this endeavor. Between 1994 and 1999, the crime rate in the Zone decreased by 38%, compared to a 20% drop citywide in the same period. Three community development corporations have been “seeded” with funds and technical assistance for capacity development. Through its “Choice Matters” initiative, EBMC provides employable Zone residents with a stipend for employer-subsidized customized training. EBMC provides residents with up to $5,000 for home ownership closing costs. EBMC provides funding and beds for substance abuse treatment. In partnership with the Division of Correction, EBMC has established a unit dedicated to employment and self-sufficiency for ex-offenders. There has been very low participation among prospective entrepreneurs in the business development initiatives developed by EBMC. Village Center employment efforts have met with mixed success, as residents who have accessed workforce services to date have been self-referred. To date, EBMC has not engaged in community organizing activities to a sufficient degree. Growth has been inhibited by limited land and infrastructure. The awarding of Empowerment Zone funding should not establish a sense of entitlement among Zone residents. Job creation does not necessarily result in the linkage of job seekers with employment opportunities. The most successful job development and placement model involves partnerships in which the employer provides customized, subsidized training with a guarantee of placement (i.e. HEBCAC’s partnerships with Johns Hopkins Hospital and University of Maryland Medical system for surgical and laboratory technician training). Community organizations such as churches and nonprofits need to be engaged on a citywide level. Even $100 million will not solve all the issues faced by Empowerment Zone residents. EBMC has laid the foundation, but growth and development must be ongoing processes. “Capital does make a difference.” Emphasis must be placed on attracting new businesses to the Zone, in addition to fostering entrepreneurship among Zone residents. In order for tax incentives to truly attract businesses, other conditions (i.e. crime) must be equal. Ms. Britton gave a Power Point presentation on the U.S. Census Bureau’s American Fact Finder (AFF) software, which is available online at [http://factfinder.census.gov], or through the Census’ main site, [http://www.census.gov]. A relational database most easily accessible through the Internet Explorer browser, AFF organizes data from the Decennial Census, the Economic Census and the American Community Survey into data sets such as demographic profiles and Geographic Comparison Tables. Ms. Britton explained that currently, only Summary File 1 information – comprising the results of questions 1-7 on the Census 2000 short form – is available through AFF. The more detailed information represented by Summary Files 2&3 will be incorporated into AFF as it becomes available. Census 2000 data was compiled according to geographical tracts and address blocks. Therefore non-citizens, individuals in transitional living situations and incarcerated individuals were among the groups whose information was counted in the Census. The Census Bureau plans to compile “long form” data on a more frequent basis by using the American Community Survey. Congressional approval is pending. Economic Census data is compiled every five years. Currently, Economic Census data from 1997 is available through AFF.